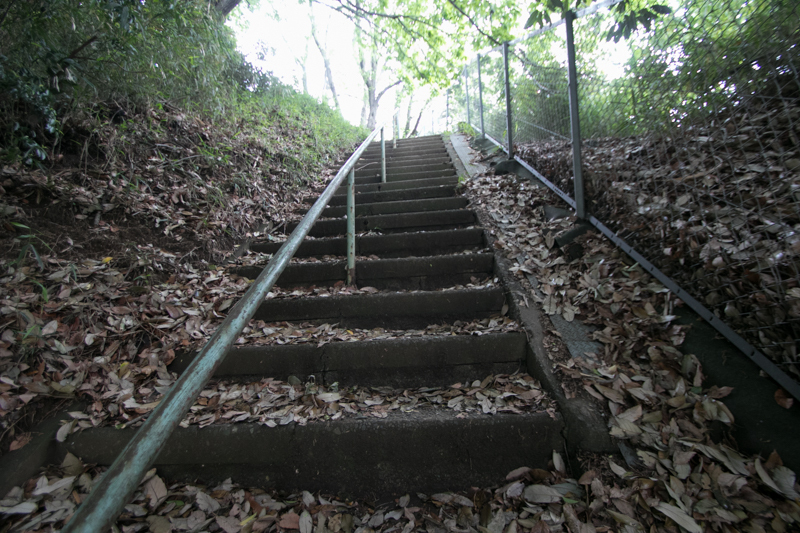 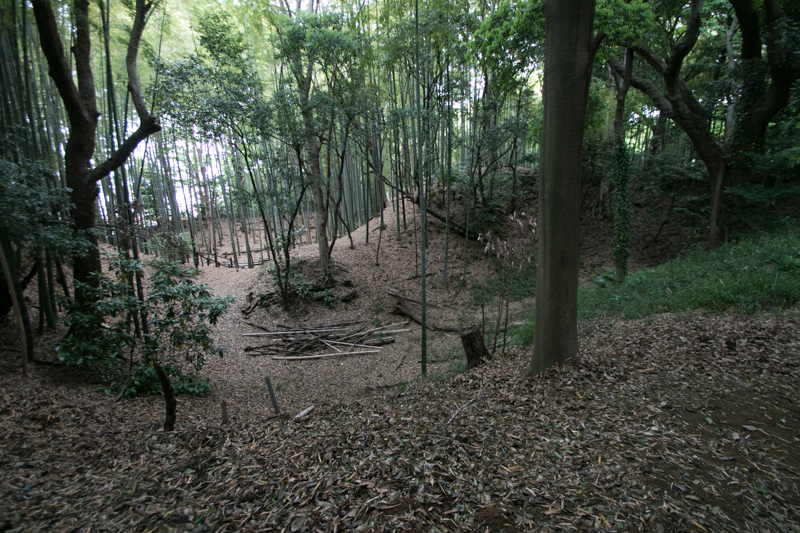 Kozukue castle (小机城) is located at 40 meter height hill which placed along Tsurumi-gawa river, at the west of current Shinyokohama station. 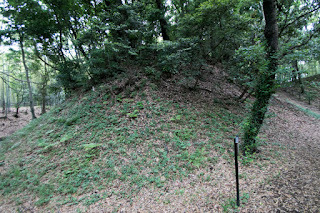 Kozukue castle is located at the border of hilly area and plain of Tsurumi-gawa river, and aside of Nakahara Kaido road, an important road straightly connected south part of Sagami province (Kanagawa prefecture) such as Odawara or Hiratsuka and major cities of Musashi province (Tokyo metropolis and Saitama prefecture) like Edo or Kawagoe. 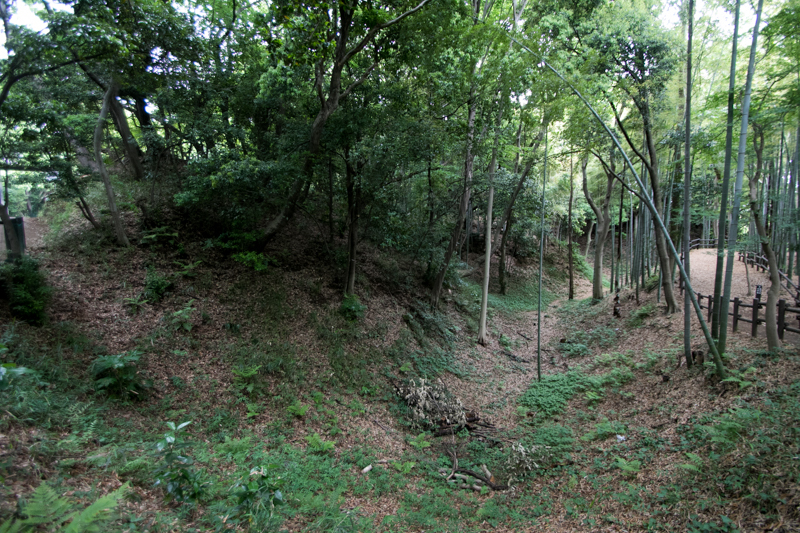 Kozukue castle was originally built in 15th century, among the warfare of the battle of Eikyo in 1438 or the battle of Kageharu Nagao in 1476. 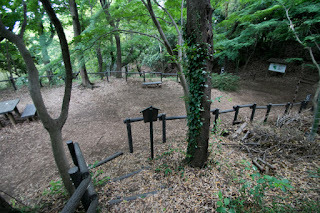 Anyway among the battle of Kageharu Nagao, Kozukue castle as used as a base of Kageharu, to encircle Edo castle, the base of his enemy Ogigayatsu Uesugi clan. 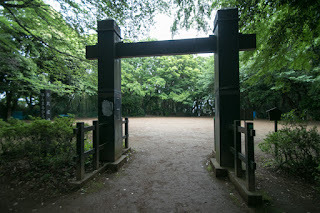 Facing this situation, Dokan Ota (1432-1486), an excellent general of Ogigayatsu Uesugi clan, turned to counter attack and siege Kozukue castle in 1478. As Kozukue castle was a secure castle this siege continued over several months, but Dokan encouraged his soldiers and finally captured Kozukue castle. 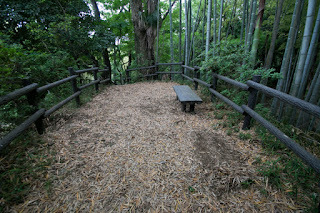 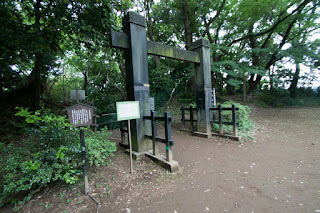 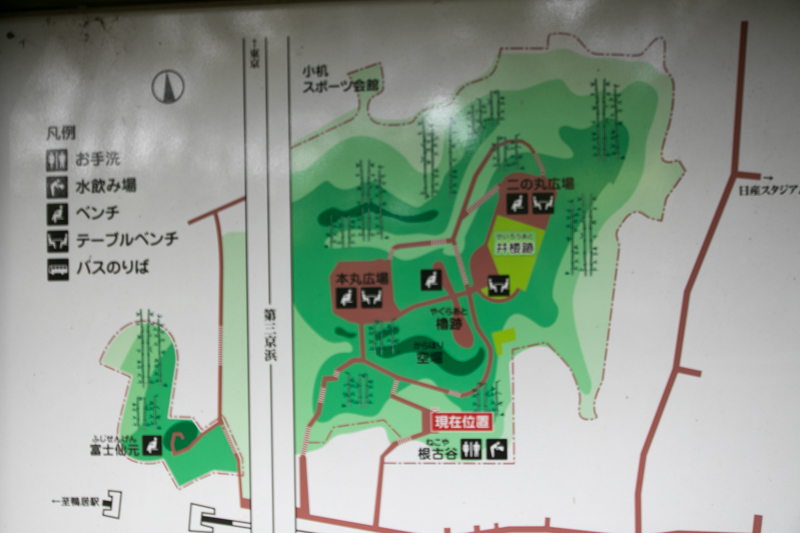 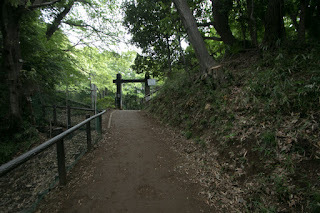 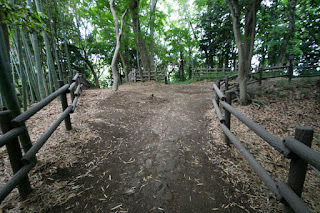 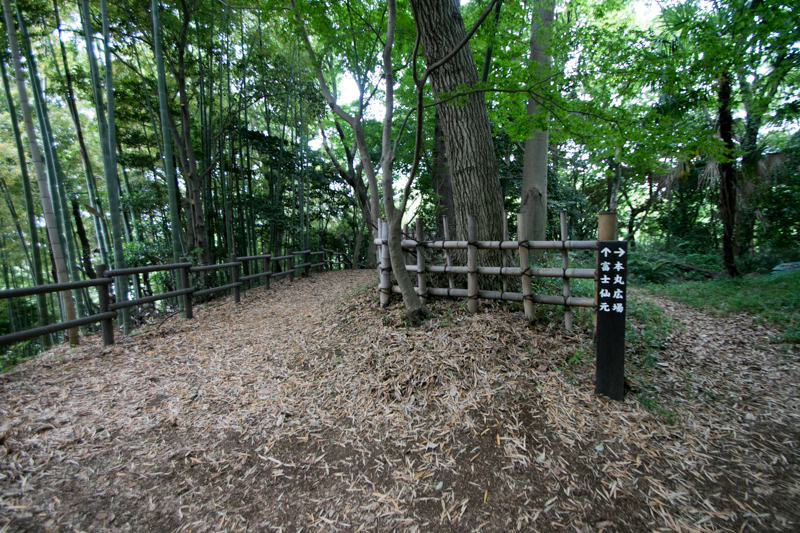 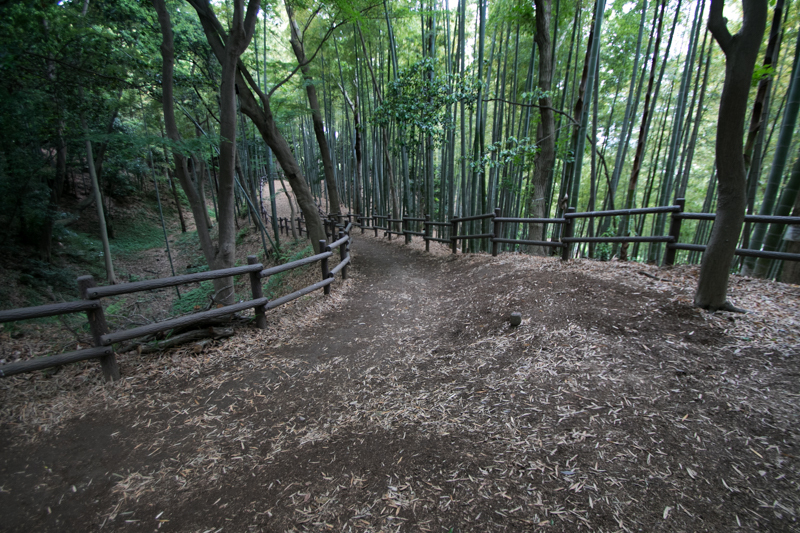 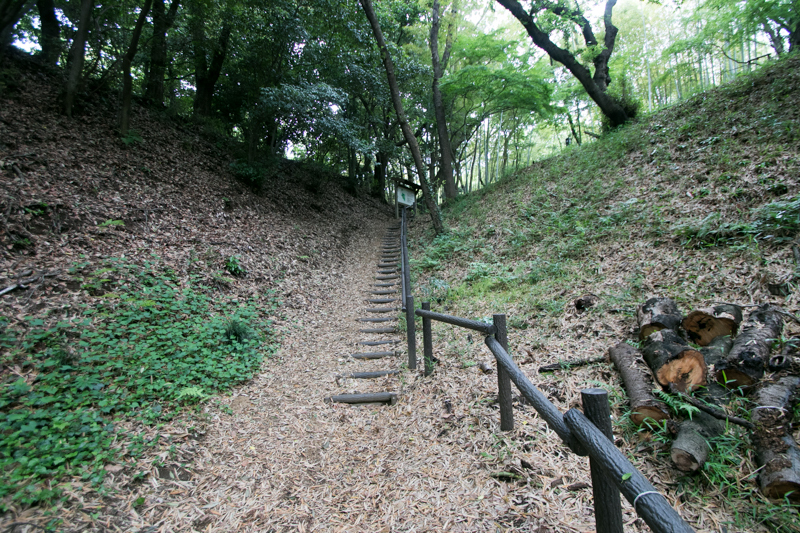 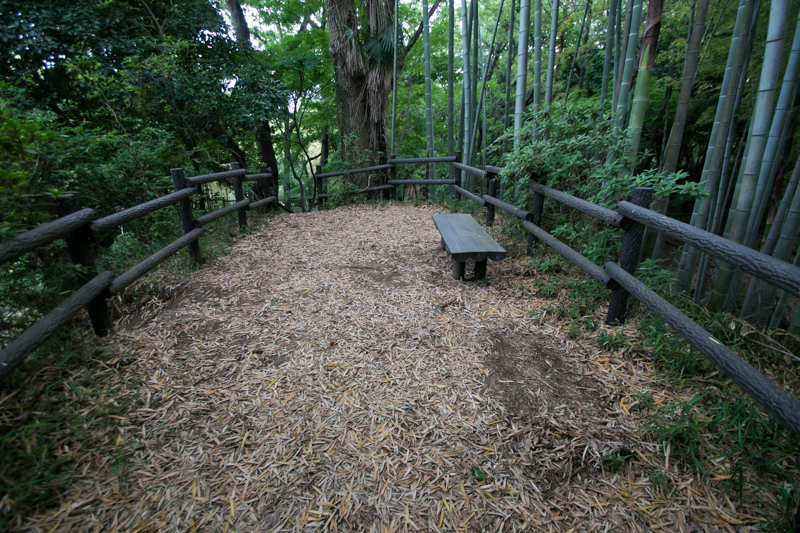 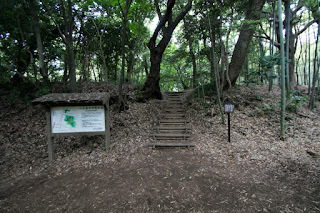 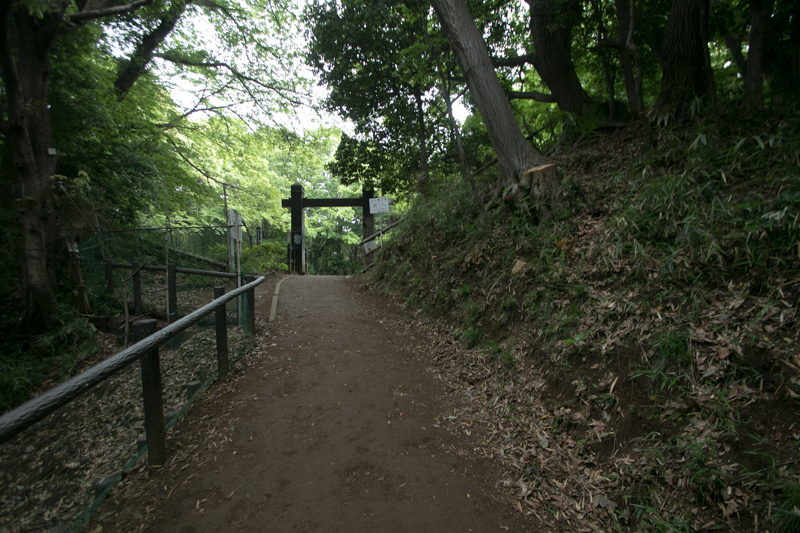 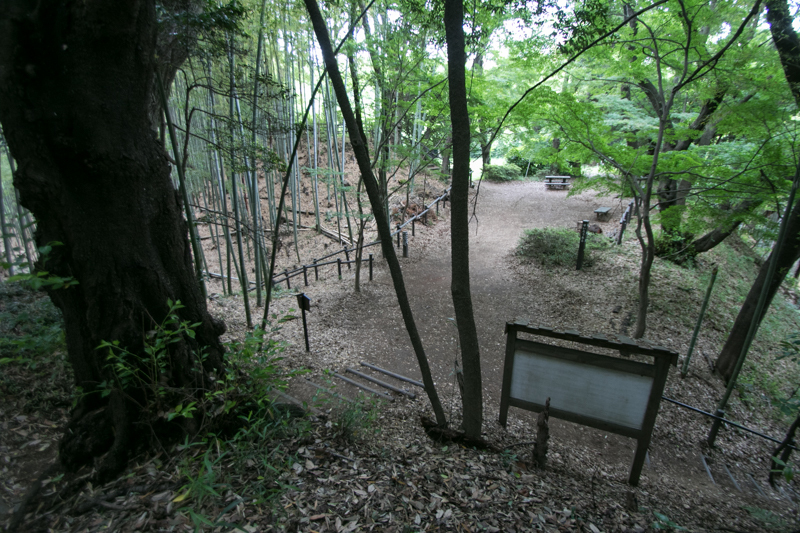 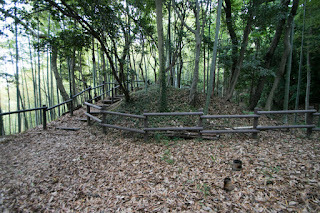 After the battle Ogigayatsu Uesugi clan managed Kozukue castle. 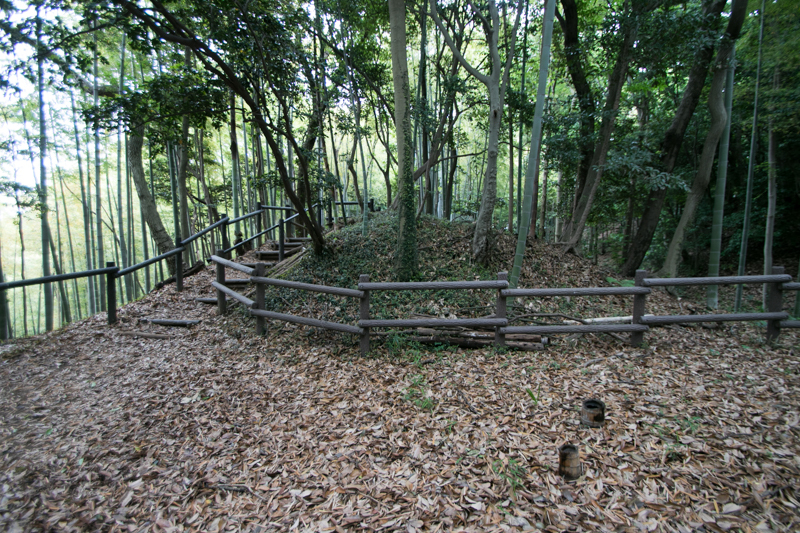 Since the beginning of 15th century, Hojyo clan significantly grew its power and made struggle against Ogigayatsu Uesugi clan, and Kozukue castle might be strengthened by Ogigayatsu Uesugi clan as a base to guard Edo castle. 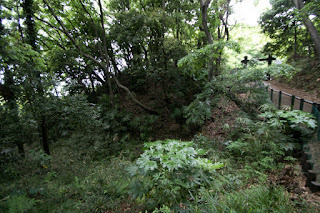 But finally in 1524 Ujitsuna Hojo (1487-1541), the second leader of Hojyo clan, captured Edo castle and seized south half of Musashi country. Now Kozukue castle was apart from battle front and became an administration base of east border of Sagami province (Kanagawa prefecture). 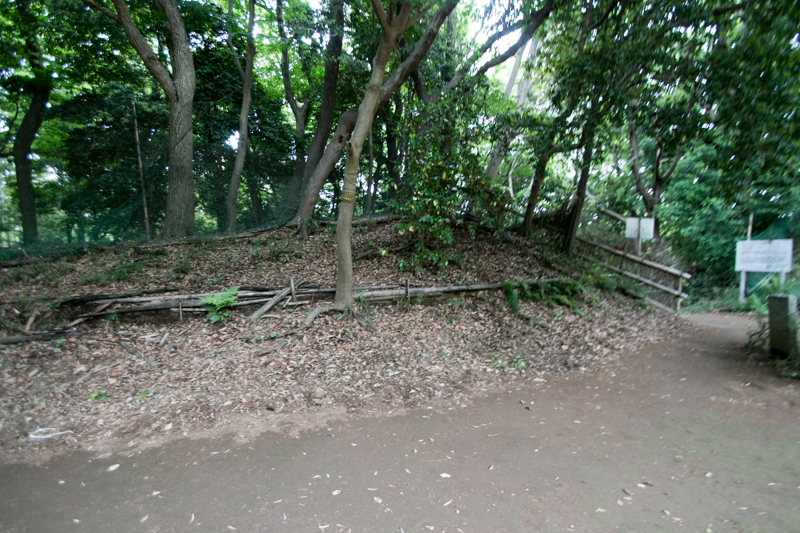 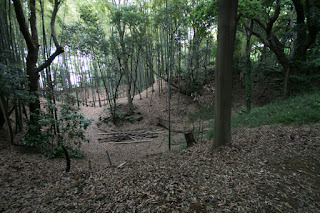 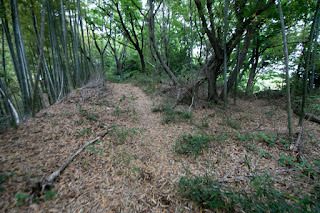 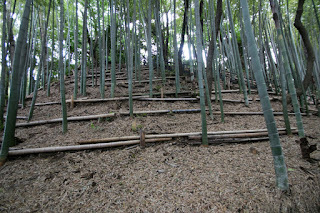 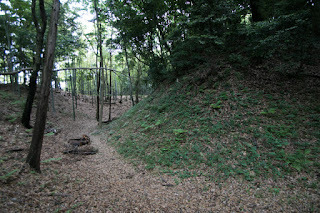 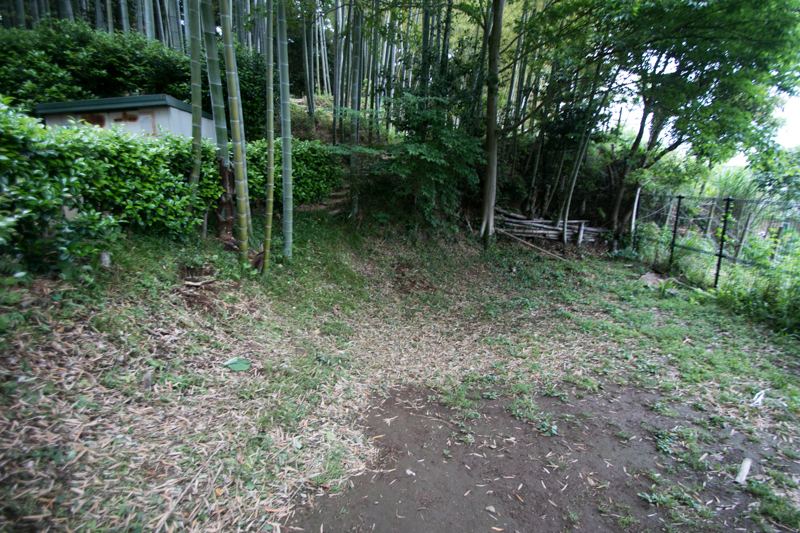 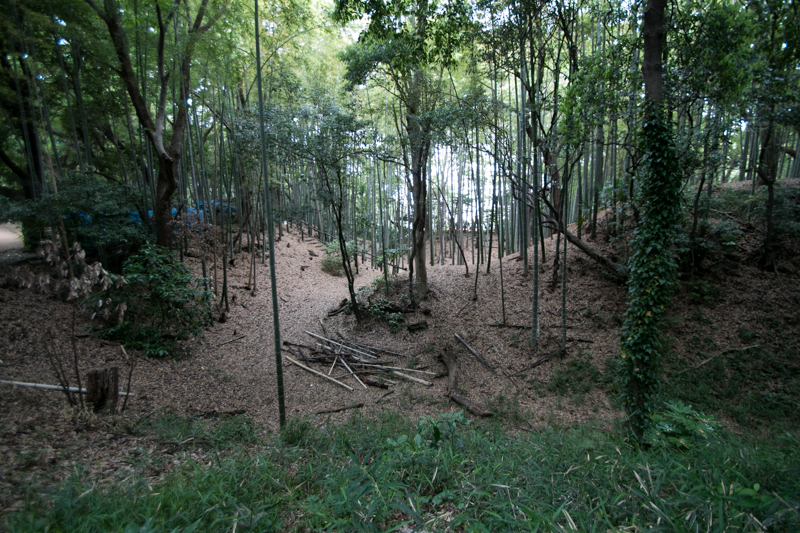 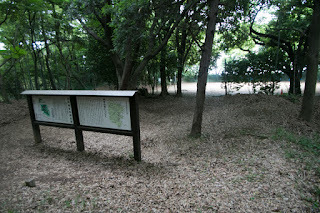 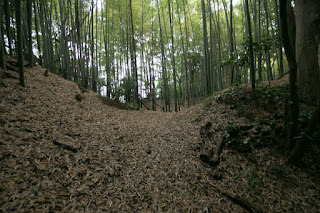 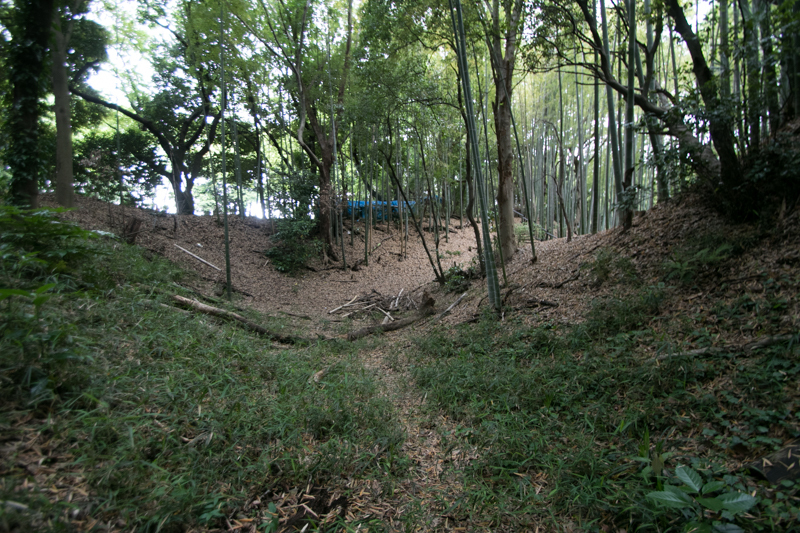 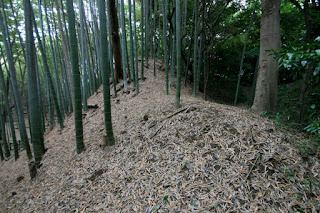 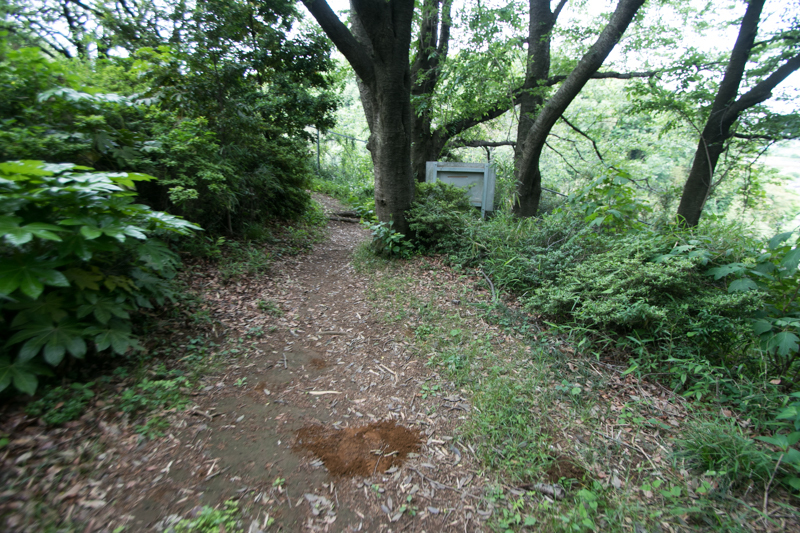 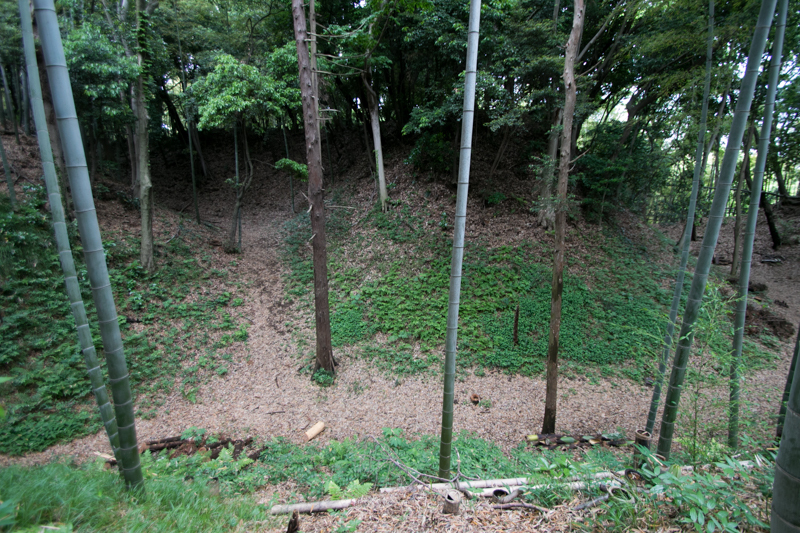 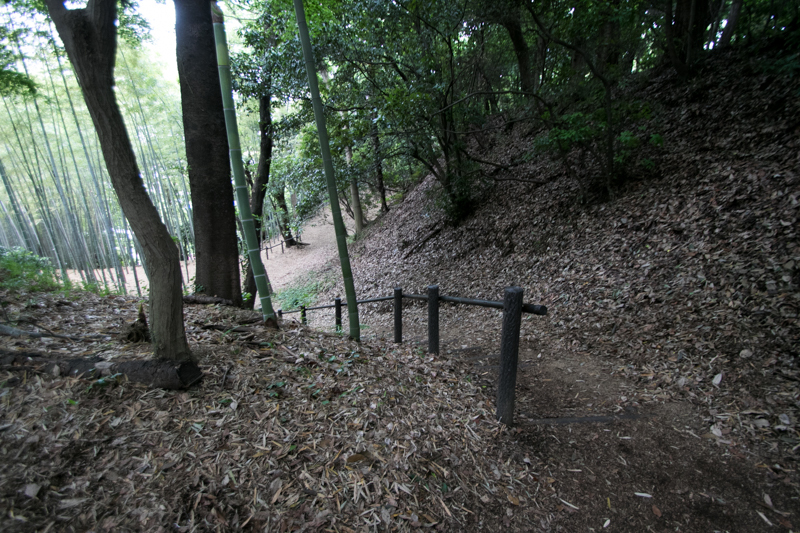 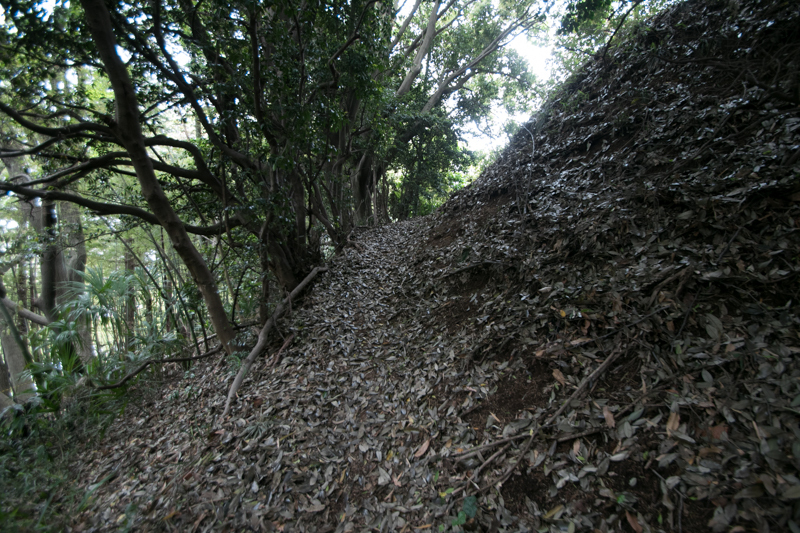 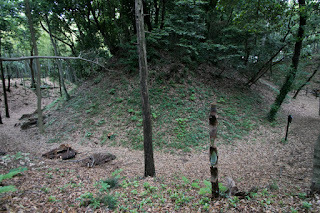 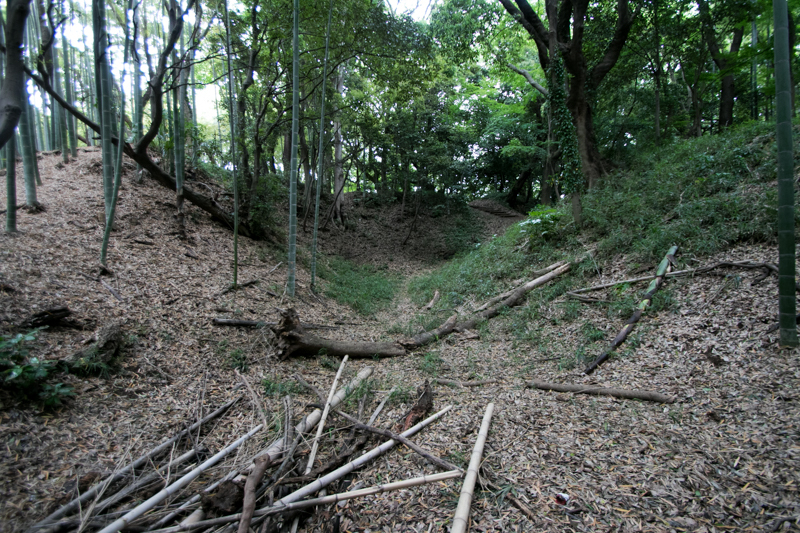 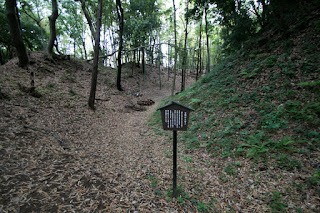 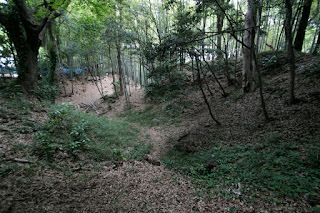 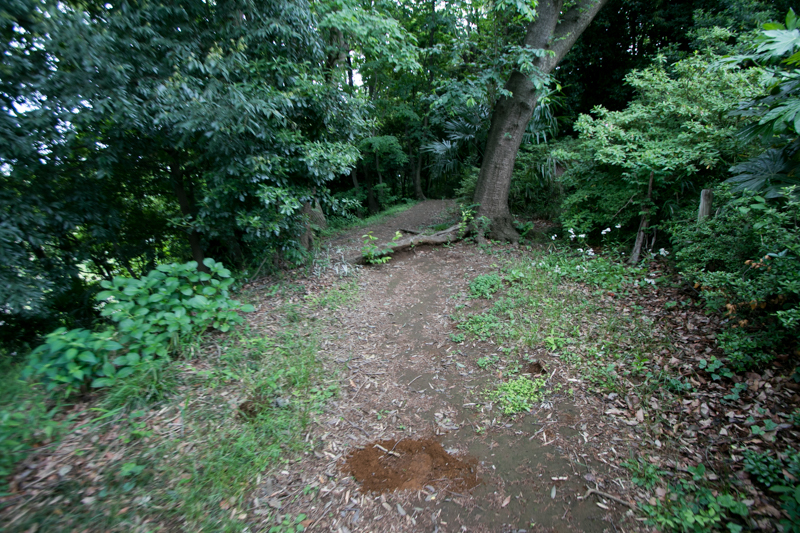 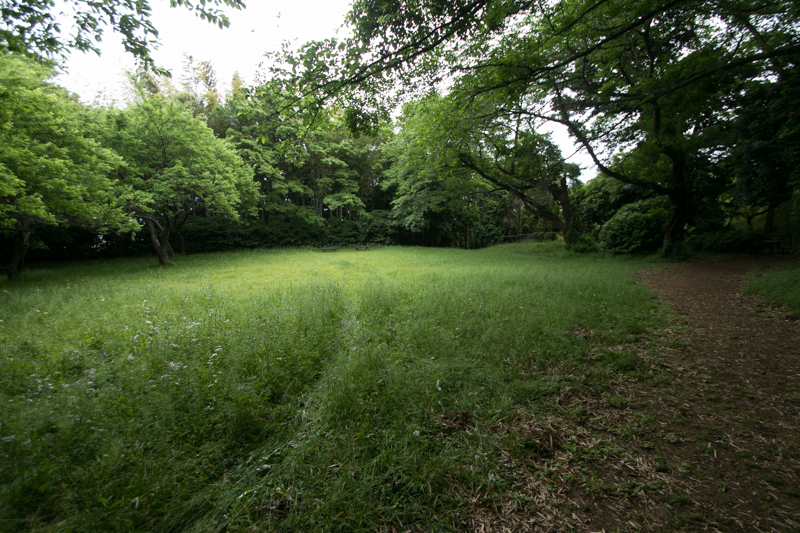 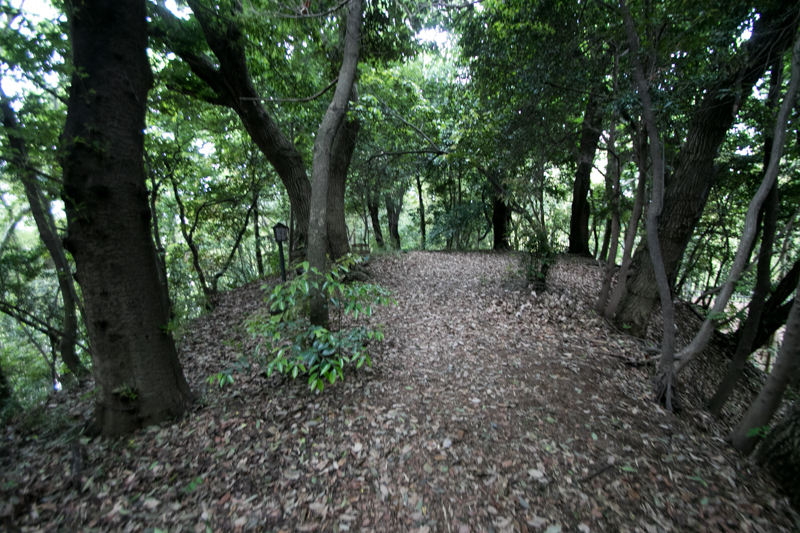 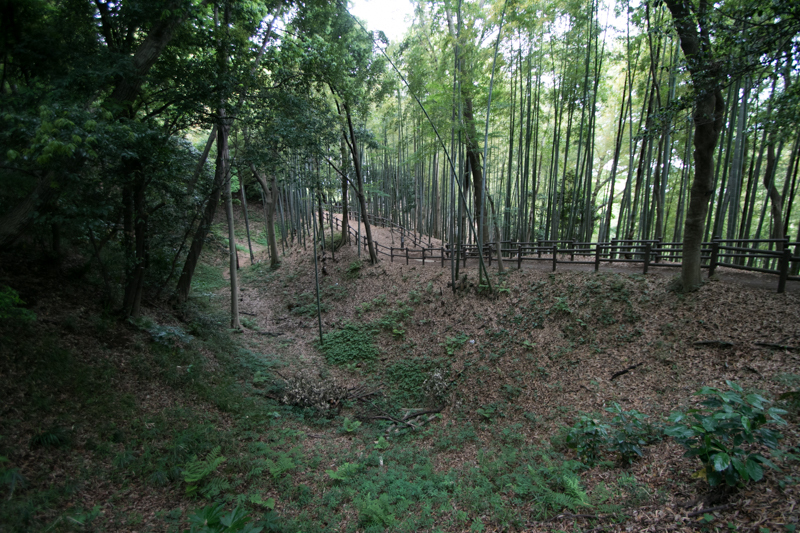 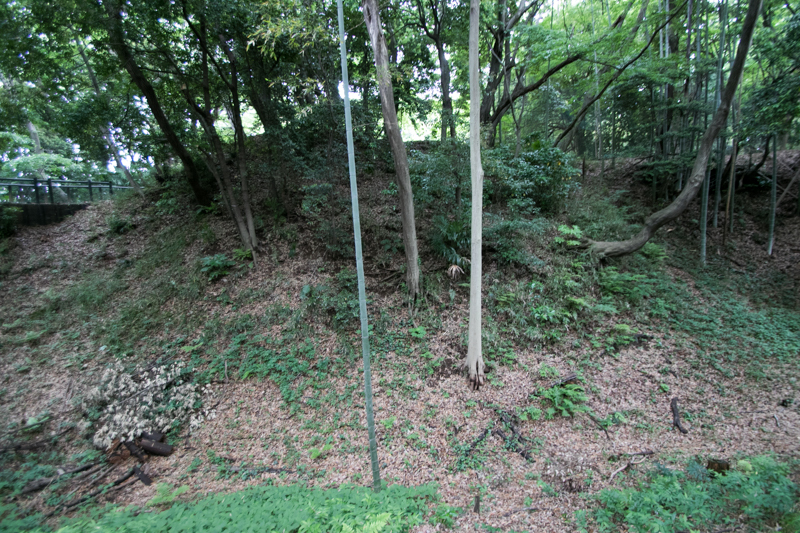 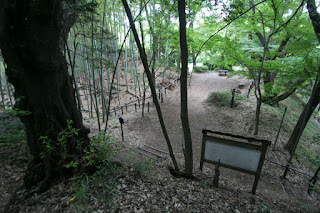 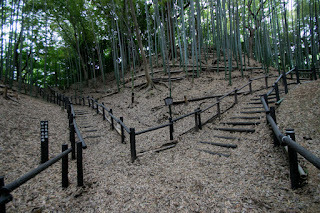 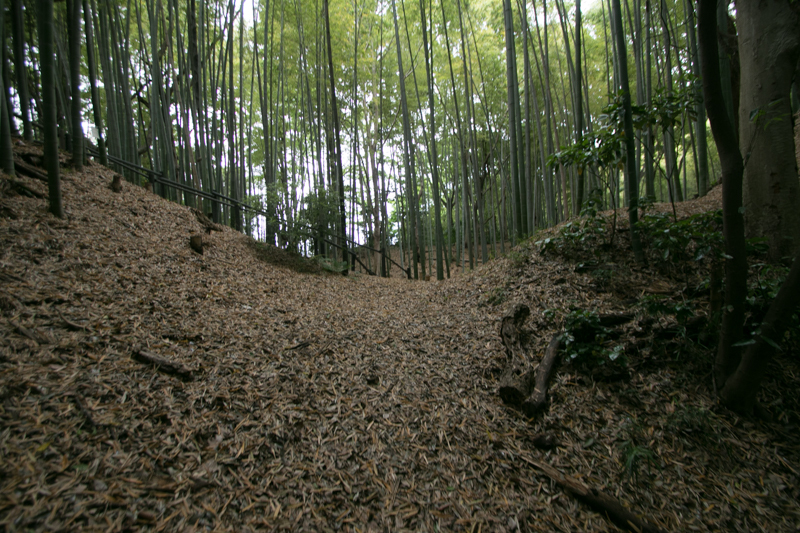 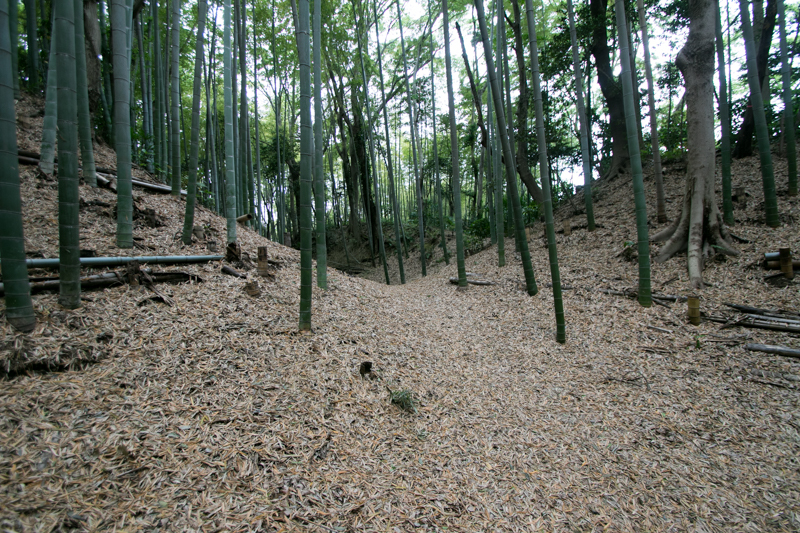 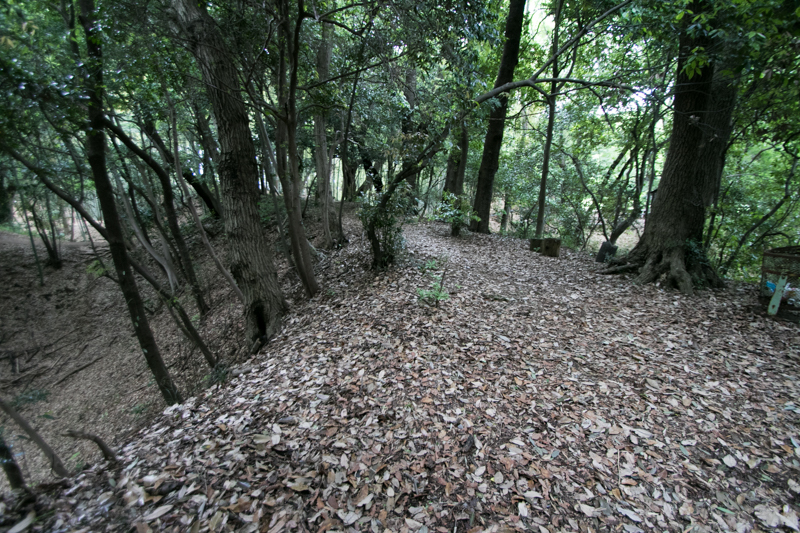 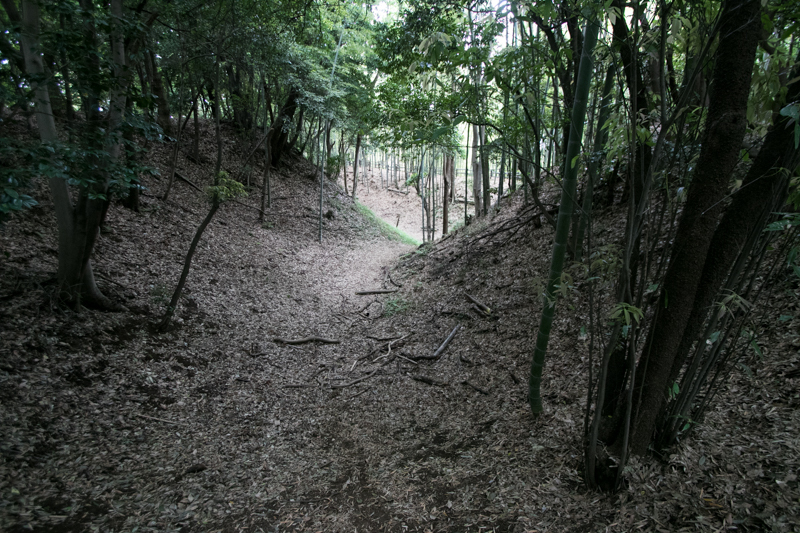 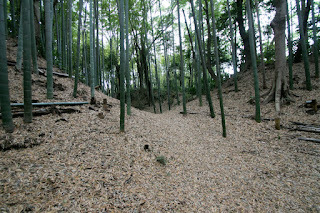 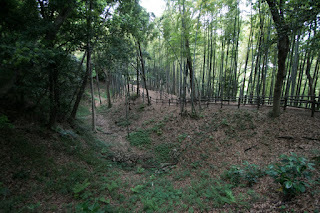 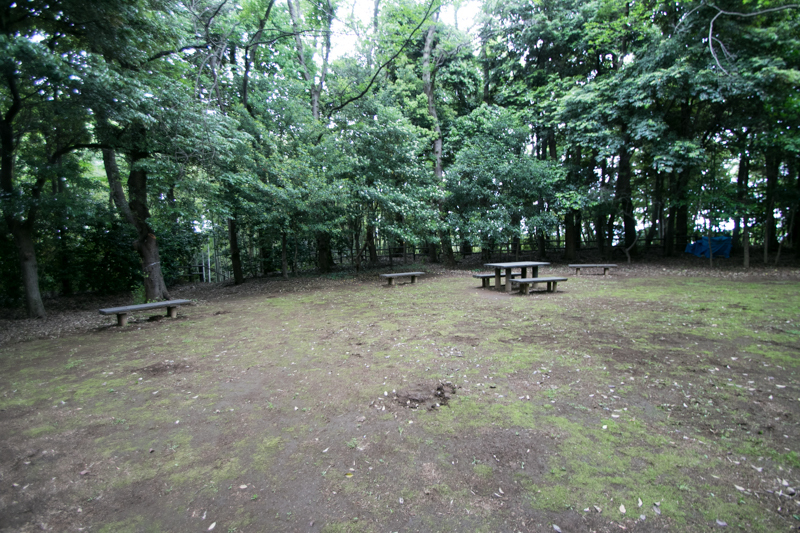 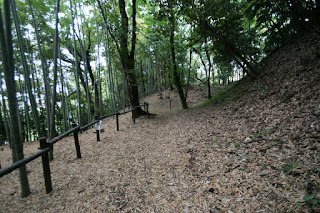 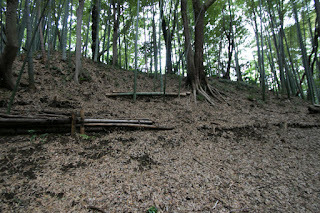 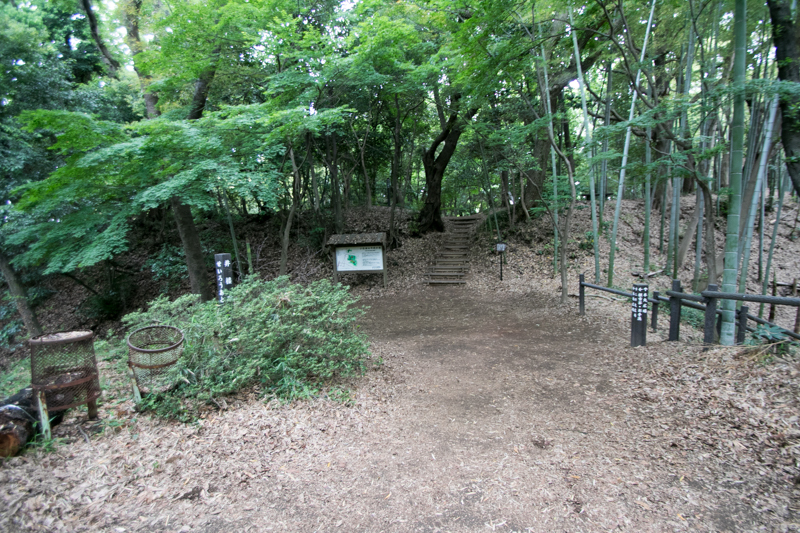 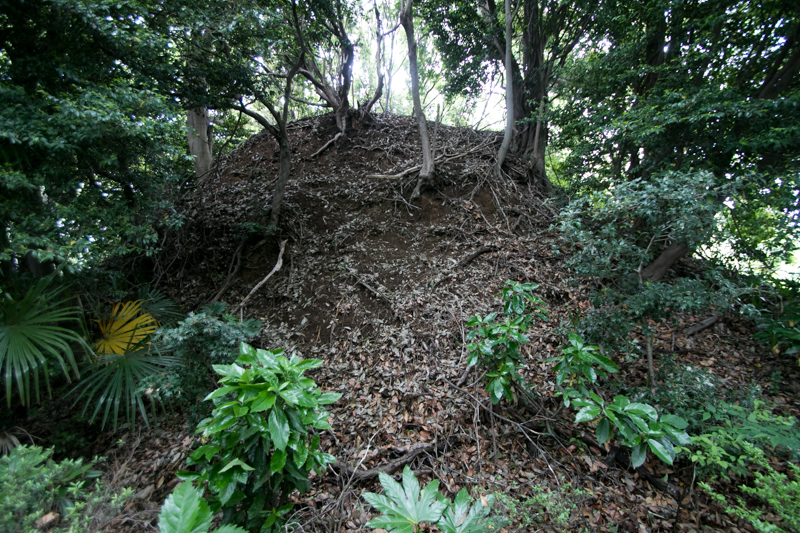 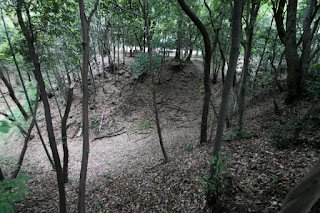 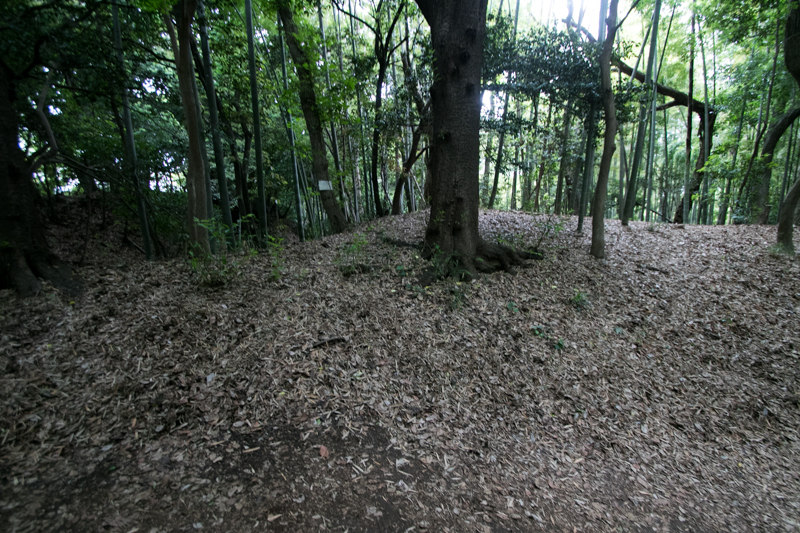 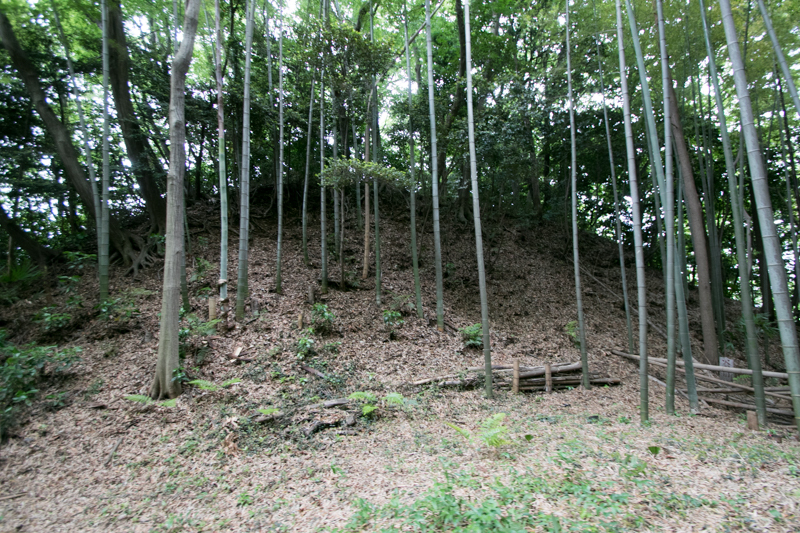 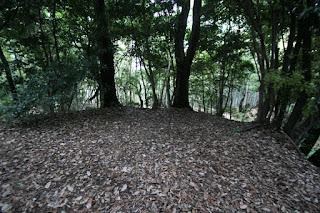 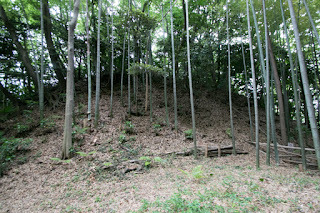 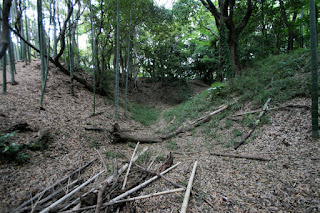 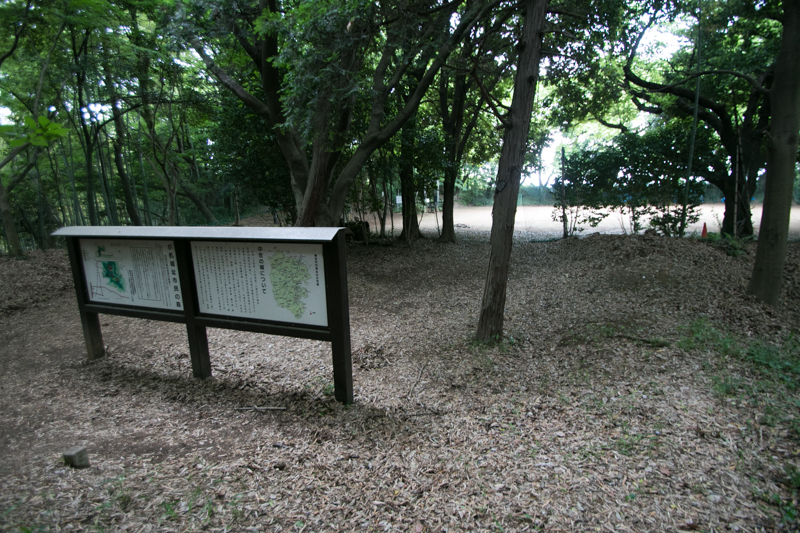 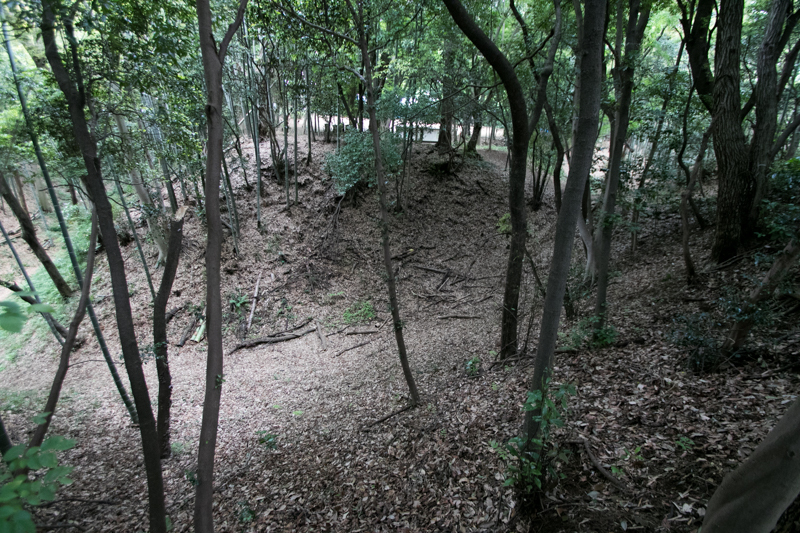 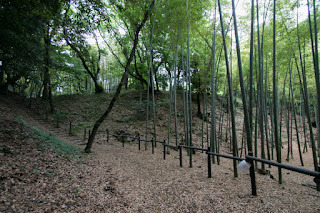 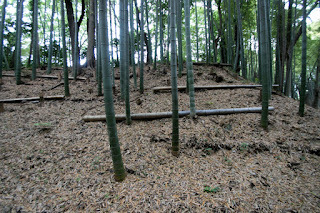 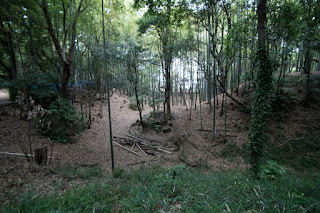 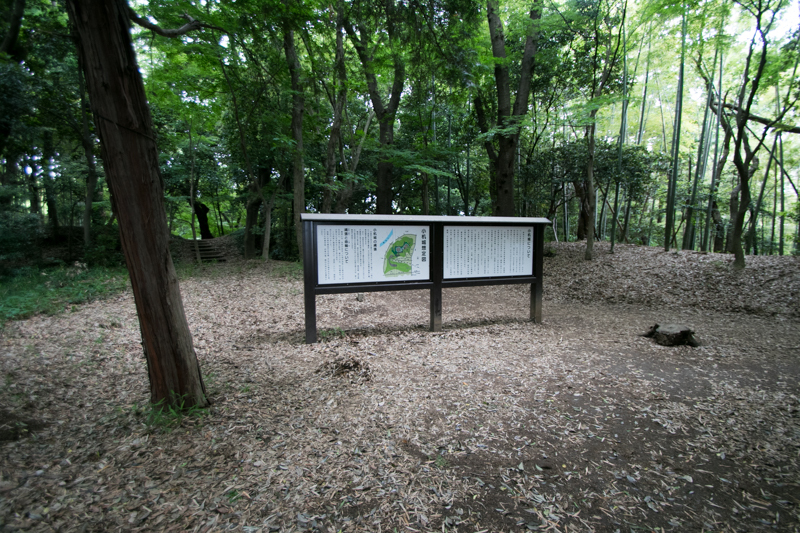 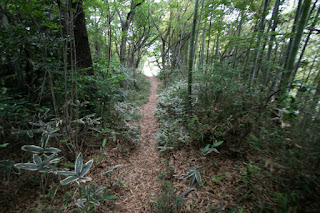 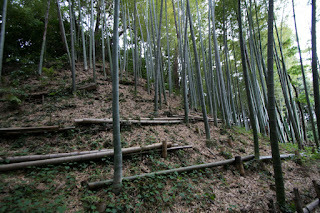 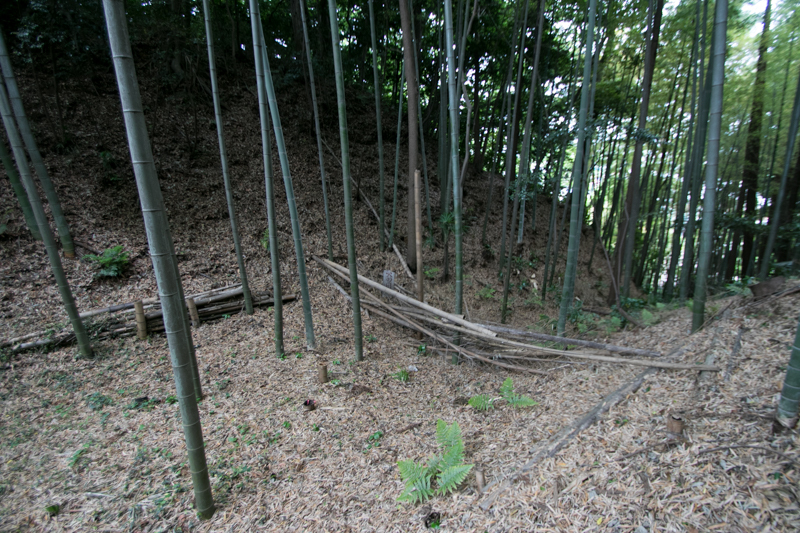 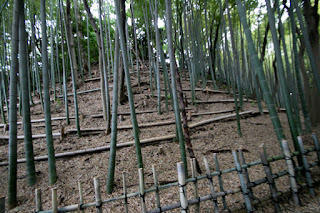 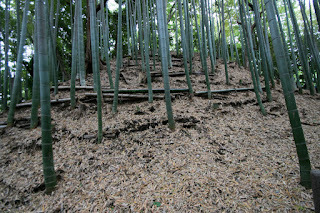 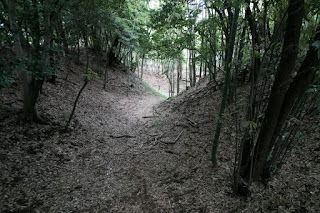 Kozukue castle spread at reverse L shaped hill. 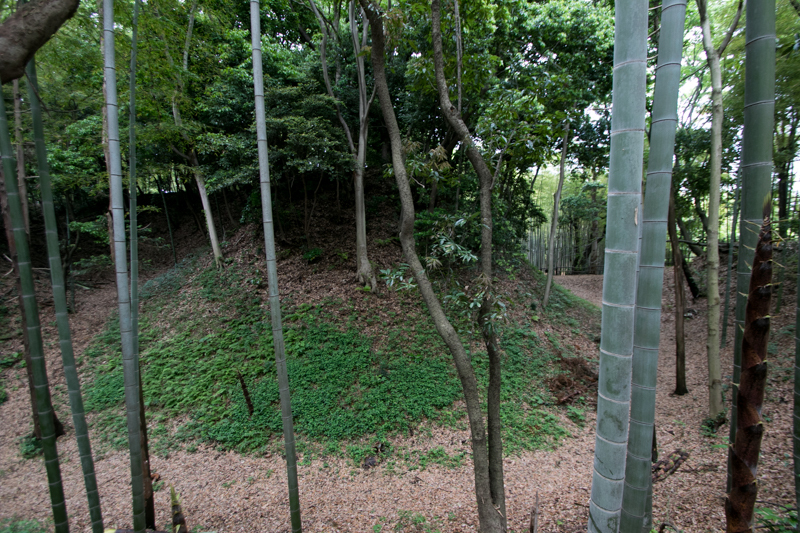 Two large terrace located at the horizontal line spread east and west, and attached terrace and corridor surrounds these two main areas. 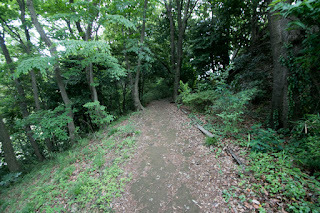 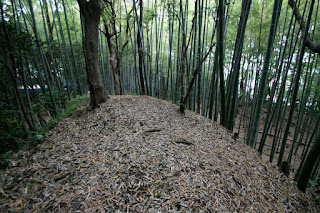 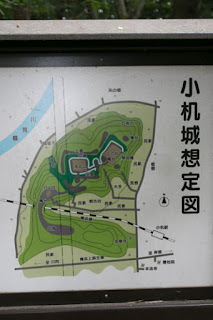 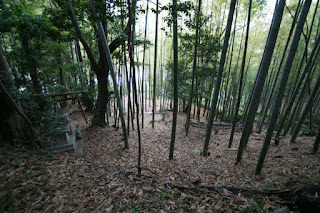 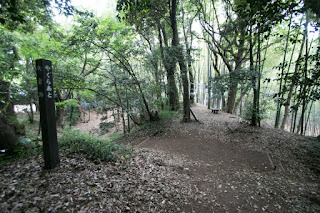 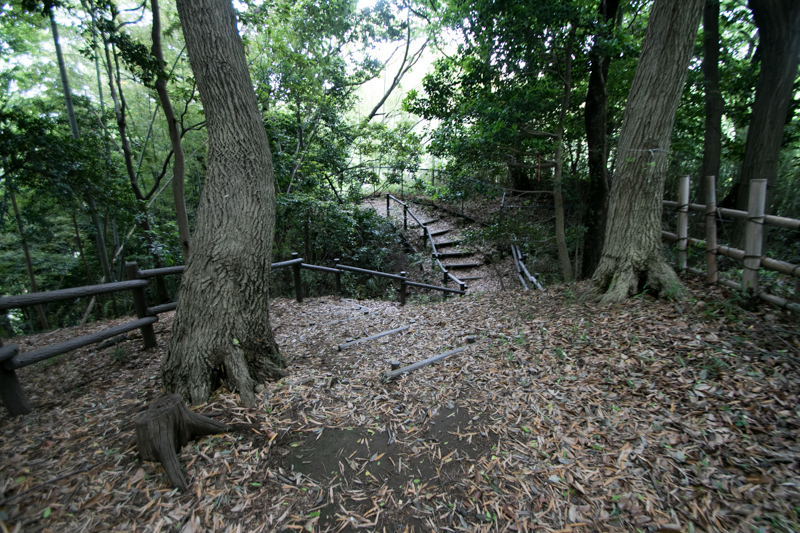 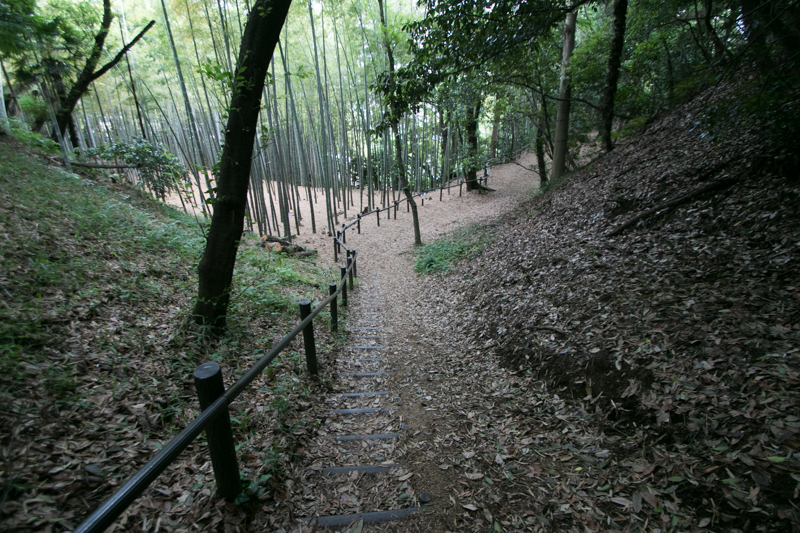 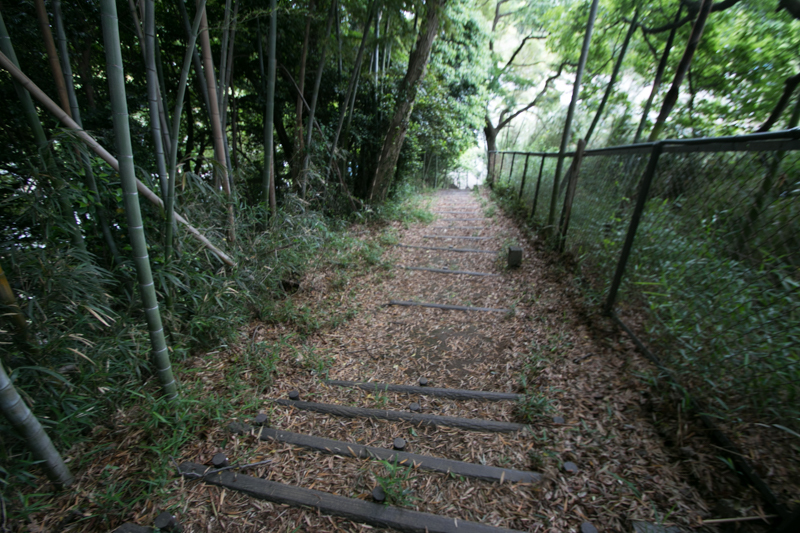 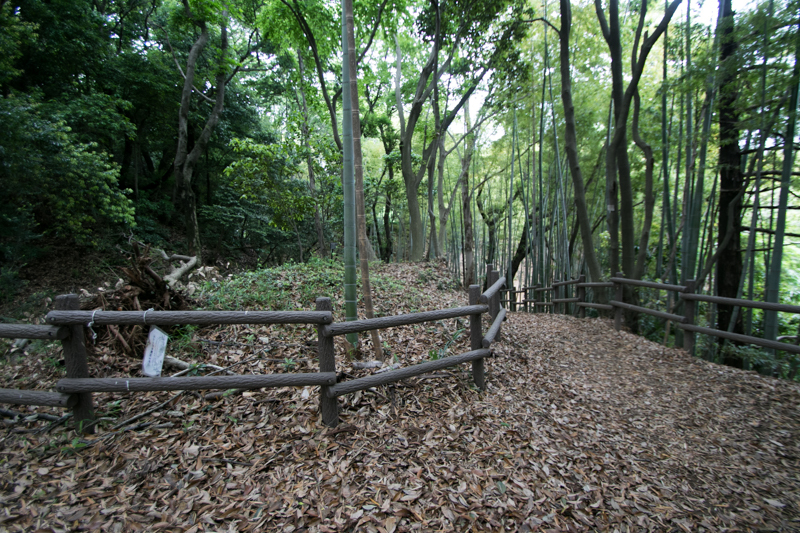 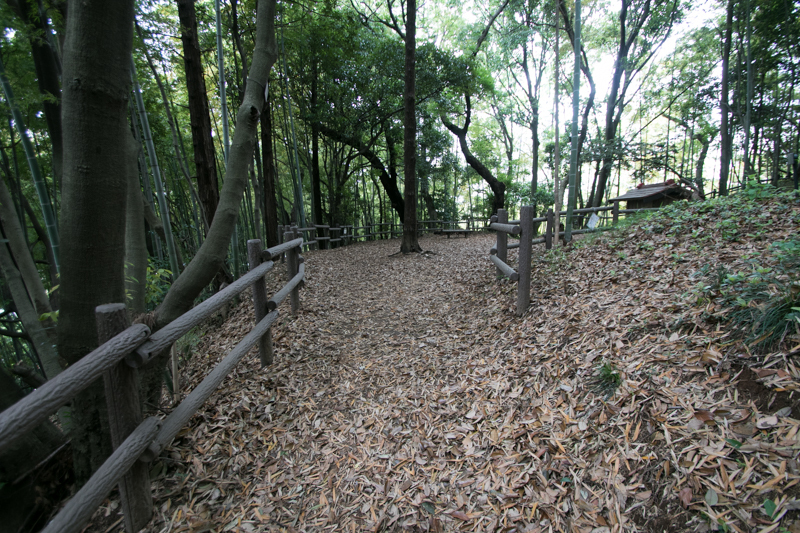 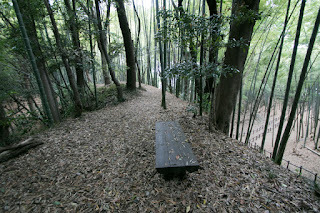 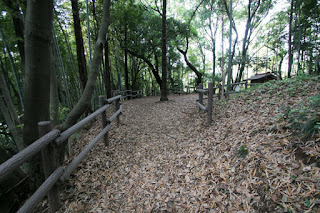 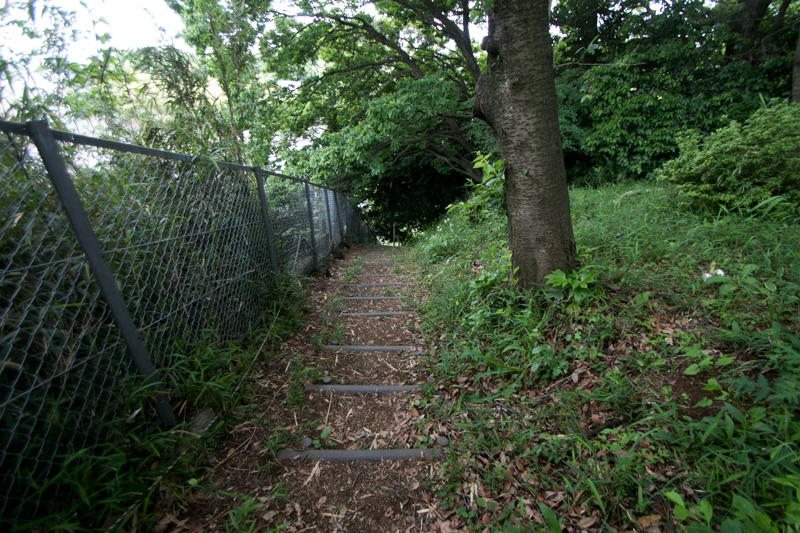 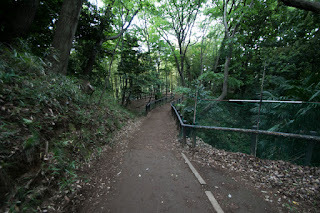 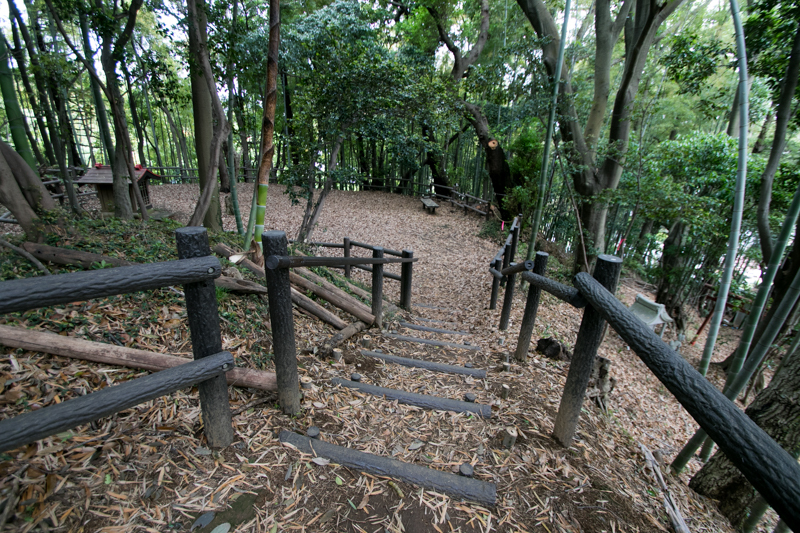 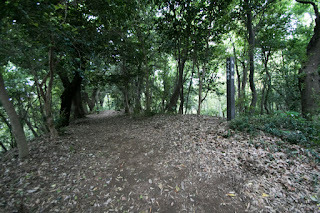 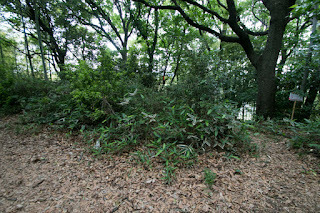 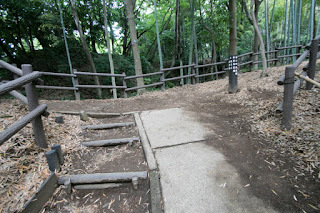 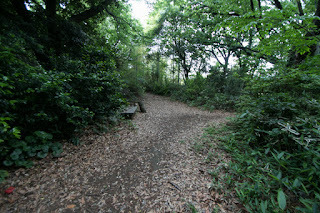 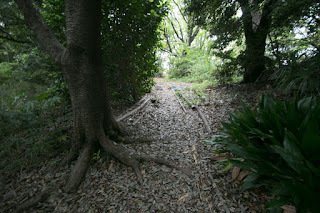 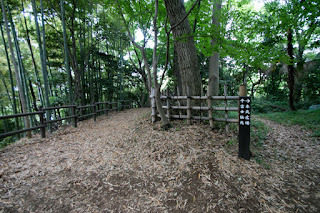 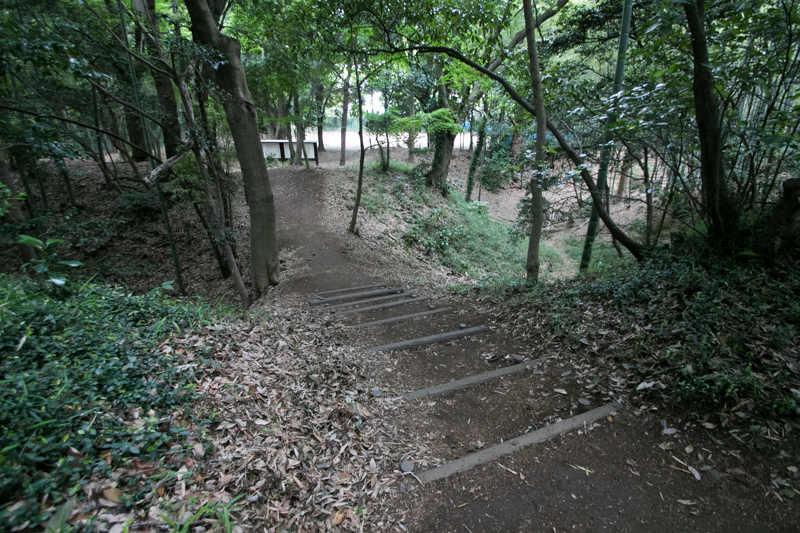 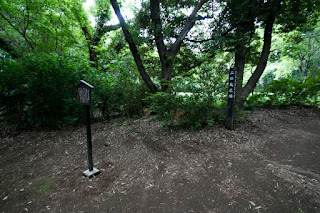 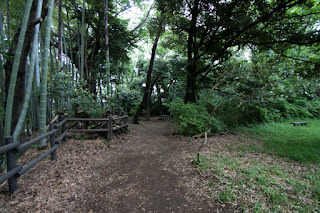 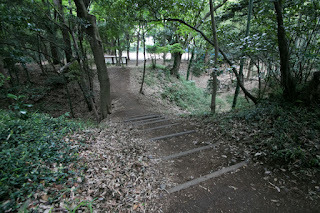 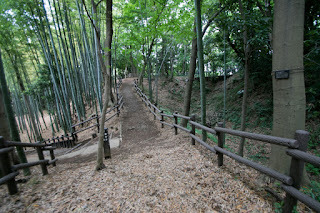 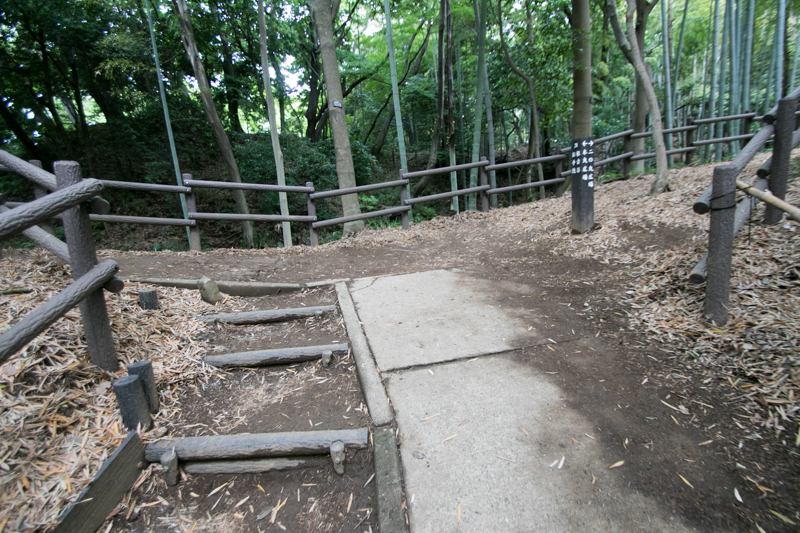 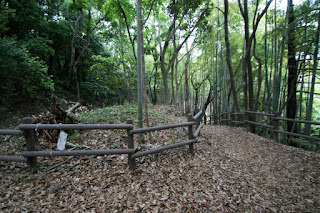 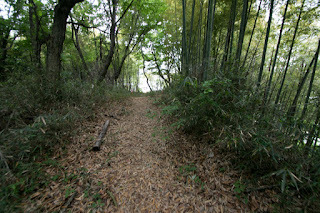 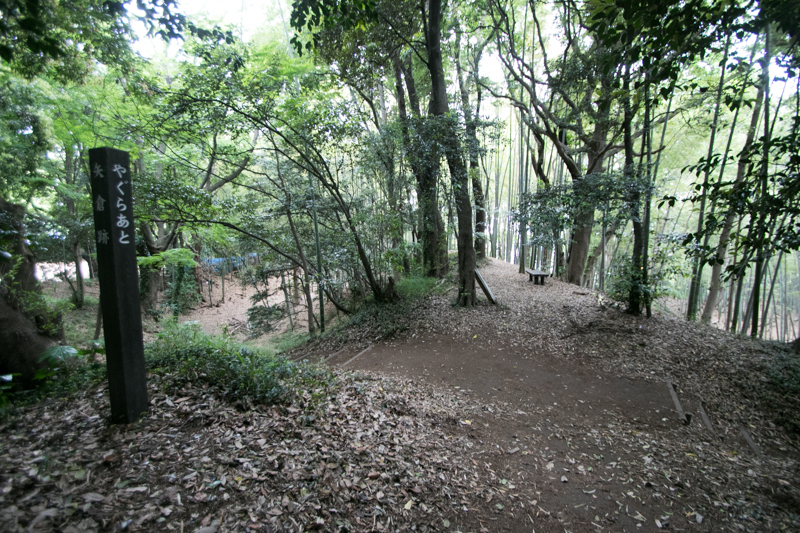 The edge of the hill is separated by deep dry moat, and opposite of Daisan Keihin road from central area, there is a small hill named as Fujisengen used as a watchtower. 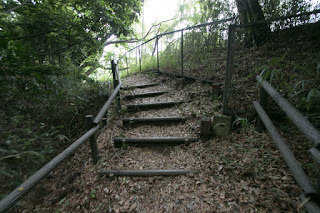 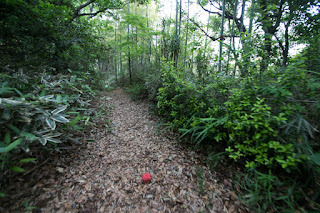 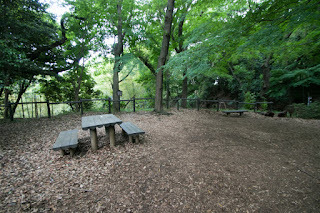 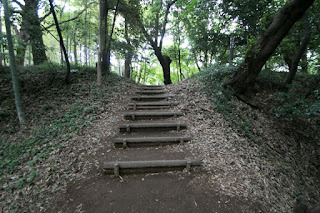 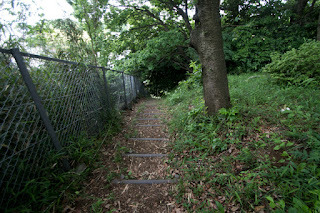 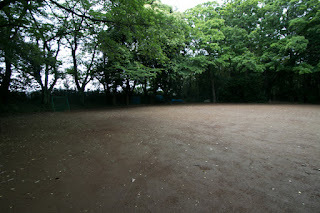 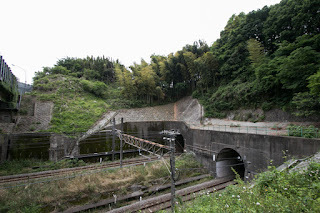 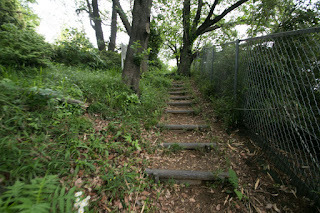 The castle might spread to opposite area of Yokohama line, but we can not enter that area. 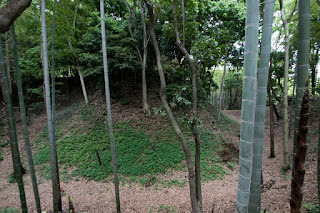 Ujitsuna at first placed Kasahara clan as a commander, but later Genan Hojo (1493-1589, originally named as Nagatsuna Hojo) managed Kozukue castle. 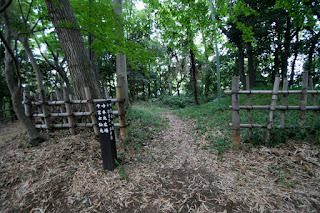 Genan is the third son of Souun Hojo (1432-1519, originally named as Nagauji Ise), the founder of Hojyo clan. 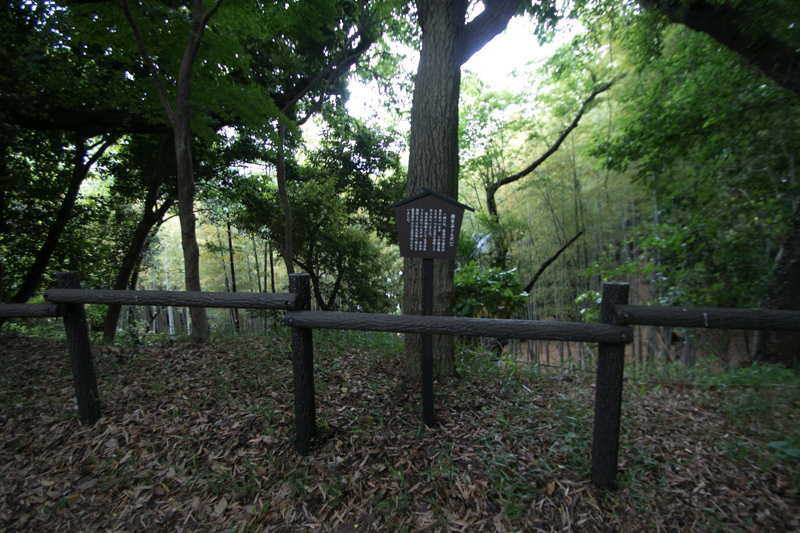 Genan is a long-lived person and alive through the most part of five generations 100 years of Hojo clan. 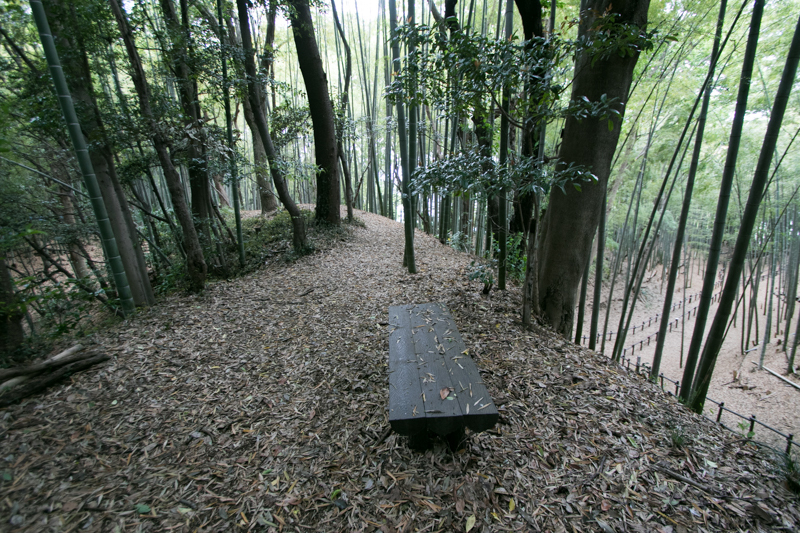 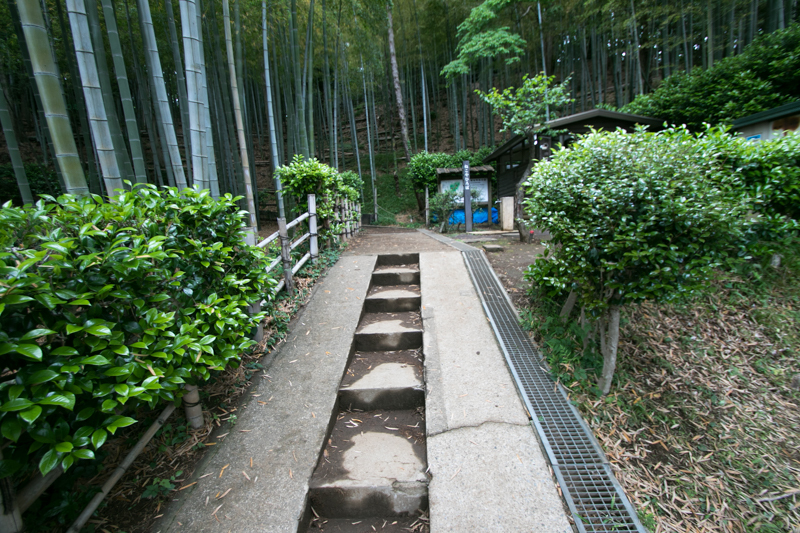 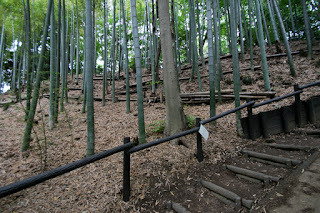 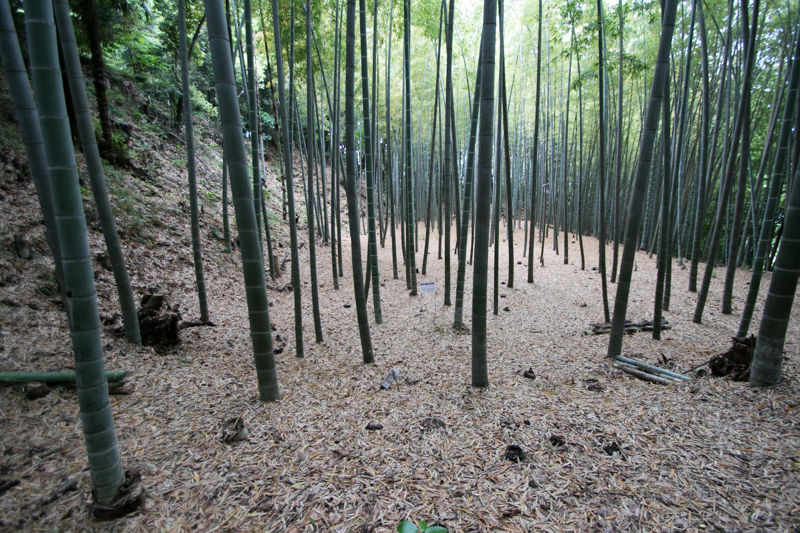 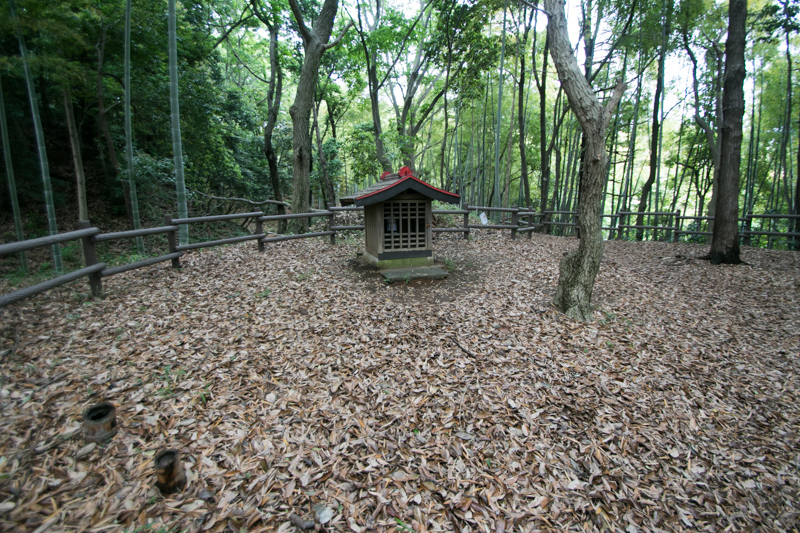 Once became the monk of Hakone Gongen temple, but later as a prominent figure of Hojo clan, Genan supported successive generations of Hojo clan leaders and had a large territory at the middle of Odawara and Edo, the important area of Hojo territory. 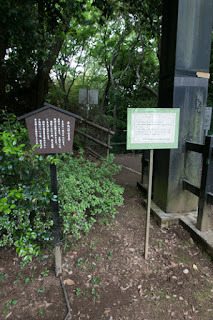 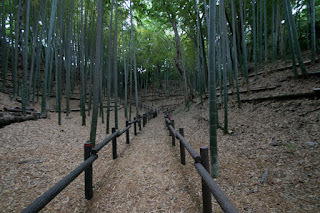 Genan well learned culture and courtesy, and his memorandum given to the daughter of third leader Ujiyasu Hojo (1515-1571) at her marriage still remains. But contrary to long lived father, his sons died in accidents. Eldest son Saburo died in youth, and both of second son Tsunshige Hojo (?-1569) and third son Chojyun Hojo (?-1569) both passed away in the battle of Kanbara castle (Shizuoka prefecture), occurred between Shingen Takeda (1521-1573), a warlord of Kai country (Yamanashi prefecture) and Hojo clan in 1569. It was rare that relative of warlords die in the local battle and this was quite unfortunate event. 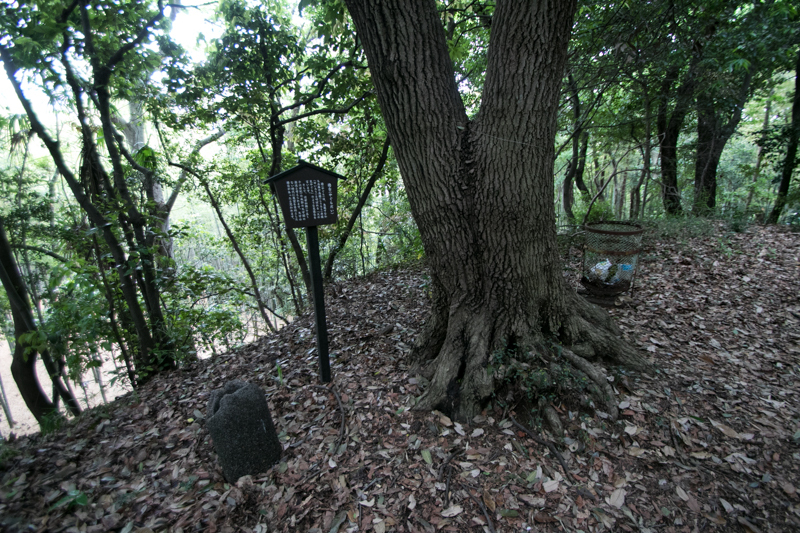 Genan who lost all son adopted Saburo Hojo (1554-1579), the seventh son of third leader Ujiyasu. 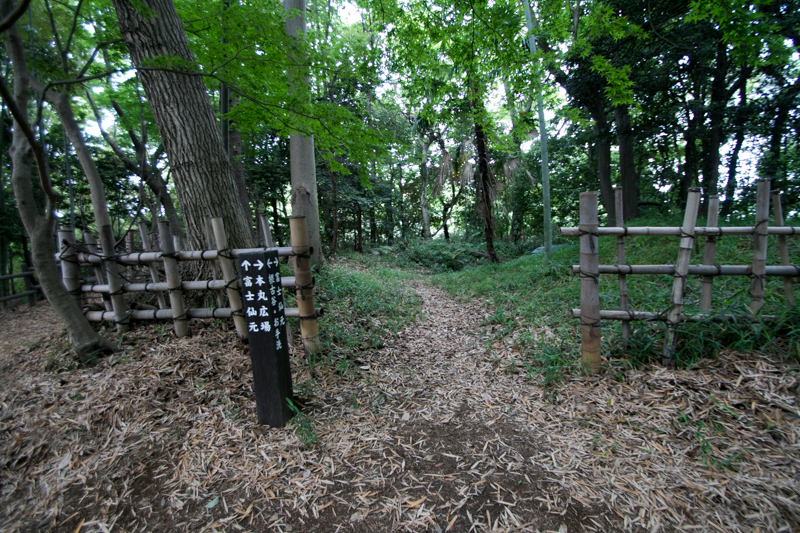 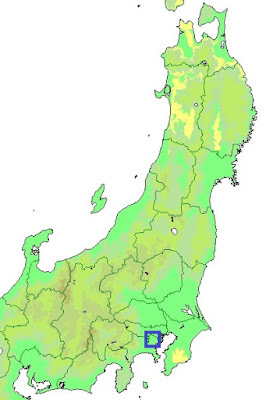 Later Saburo was adopted by Kenshin Uesugi (1530-1578), a warlord of Echigo country (Niigata prefecture) at the time of the alliance between Hojyo clan and Uesugi clan, and named as Kagetora Uesugi. 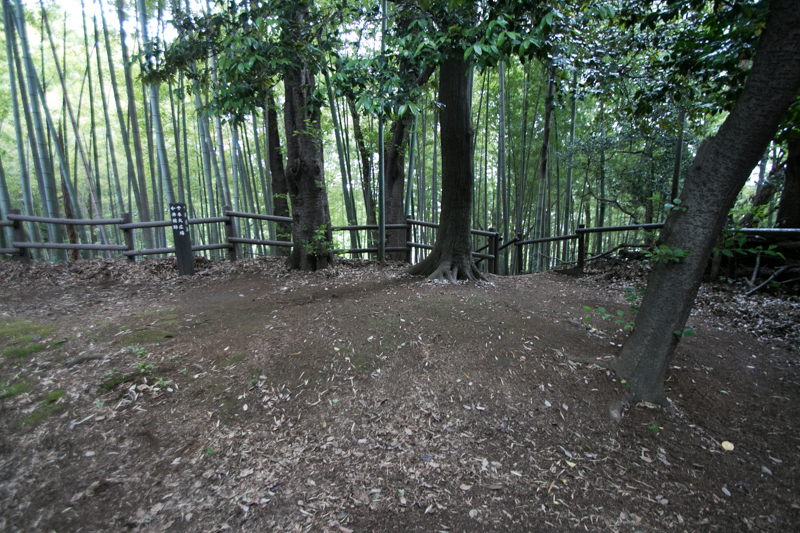 But after the death of Kenshin, Kagetora became the participant of struggle for successor but defeated by another participant Kagekatsu Uesugi (1556-1623), and killed himself at Samegao castle (Niigata prefecture) in 1579. 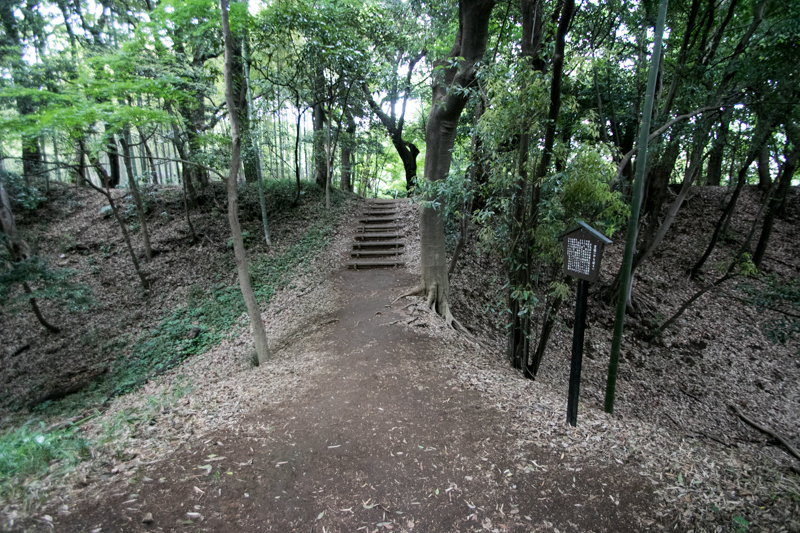 Being lost all of successors, Genan left Kozukue castle to Ujimitsu Hojo (?-1590), his son in law, and got into the semi-retired life. 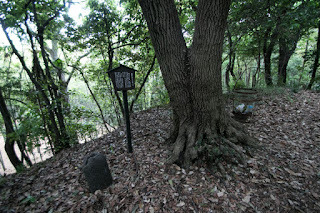 Genan lived 10 years after that and died ill in 1589. 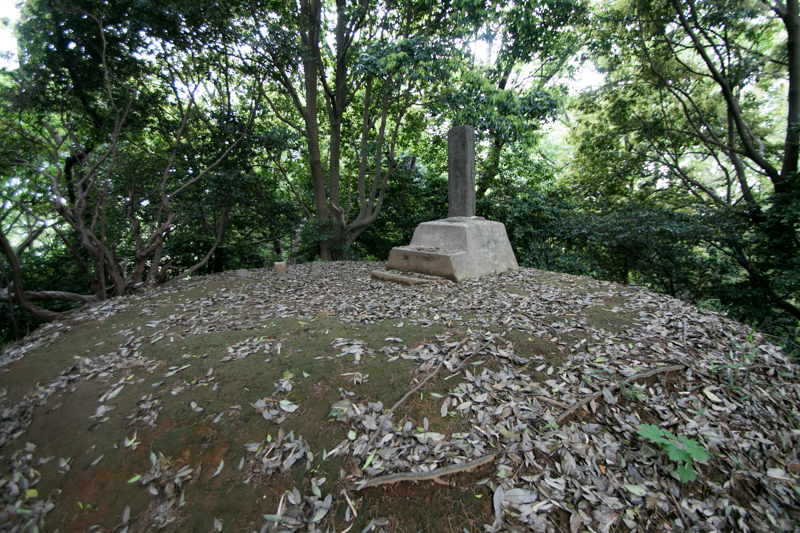 With in one year from his death, Hojyo clan was attacked by central ruler Hideyoshi Toyotomi (1537-1598), and was extinguished only in half year. 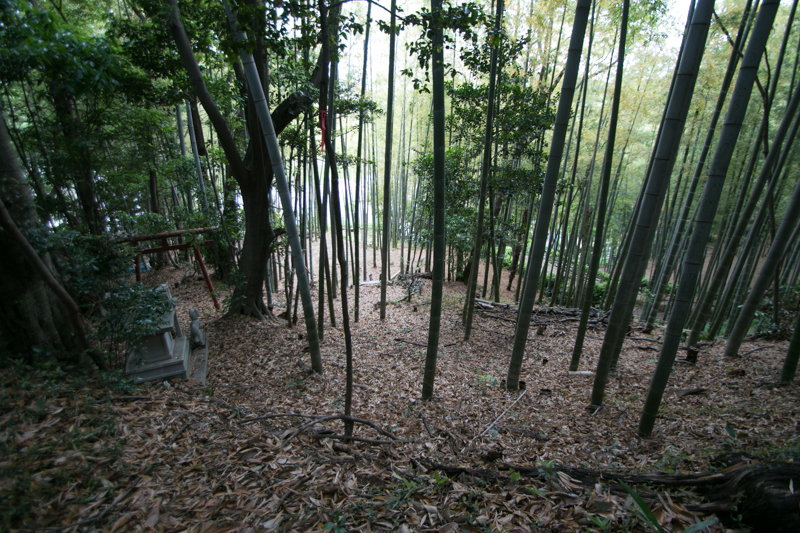 Genan exactly lived from beginning to the end of Hojo clan. 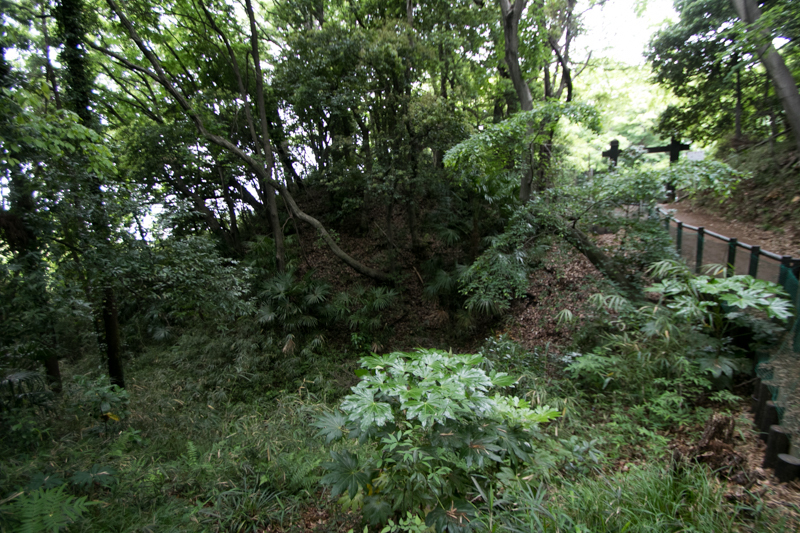 After the extinction of Hojo clan Kozukue castle was abolished. 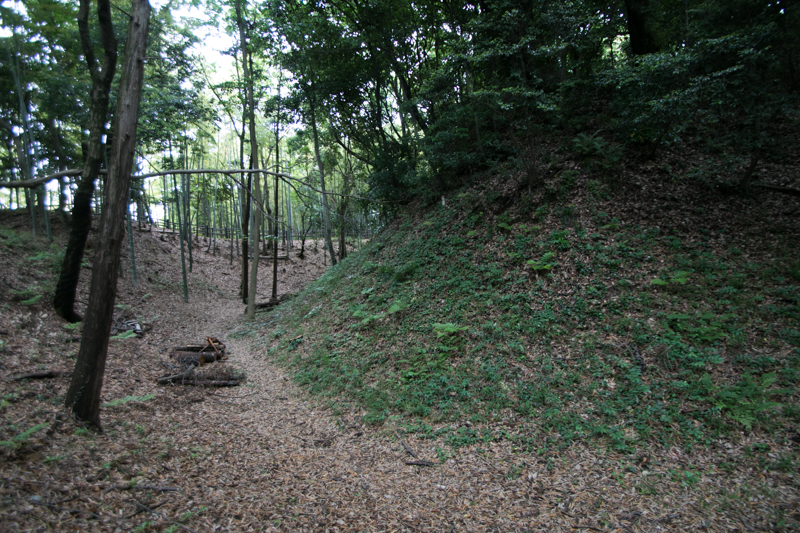 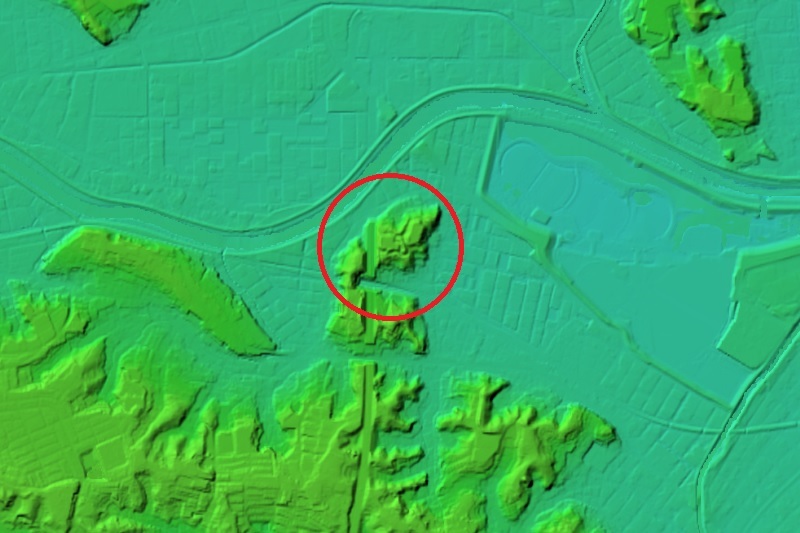 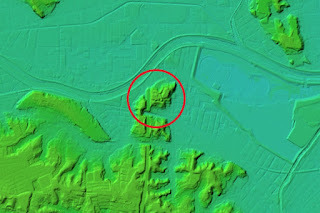 As being located on isolated hill, the site of the castle had been kept miraculously, and the shape of early stage medieval castle is well preserved in the city area. 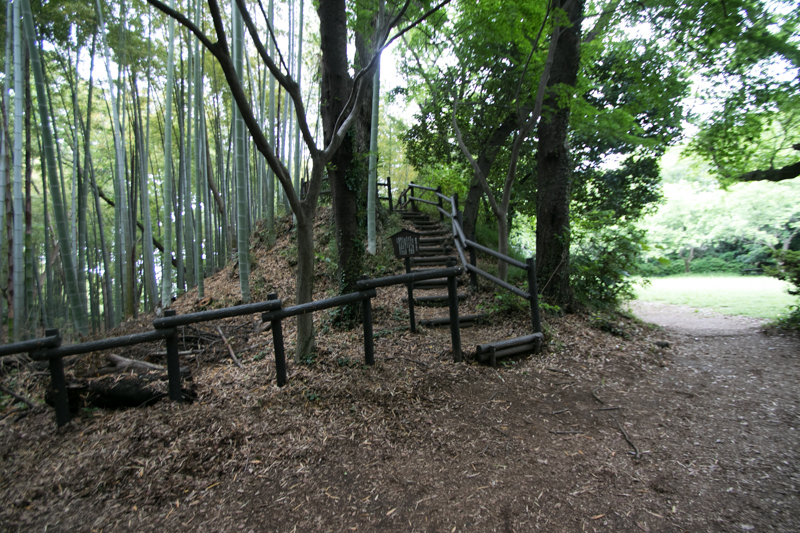 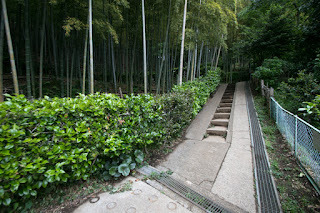 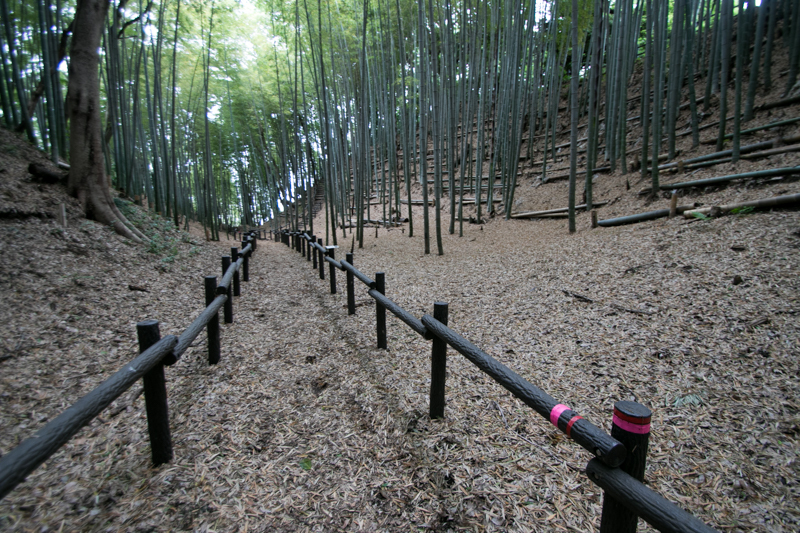 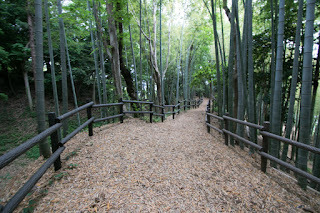 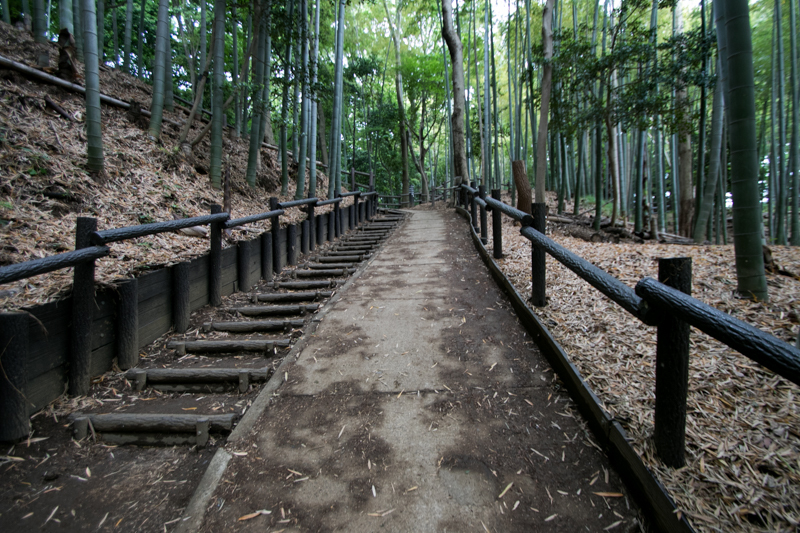 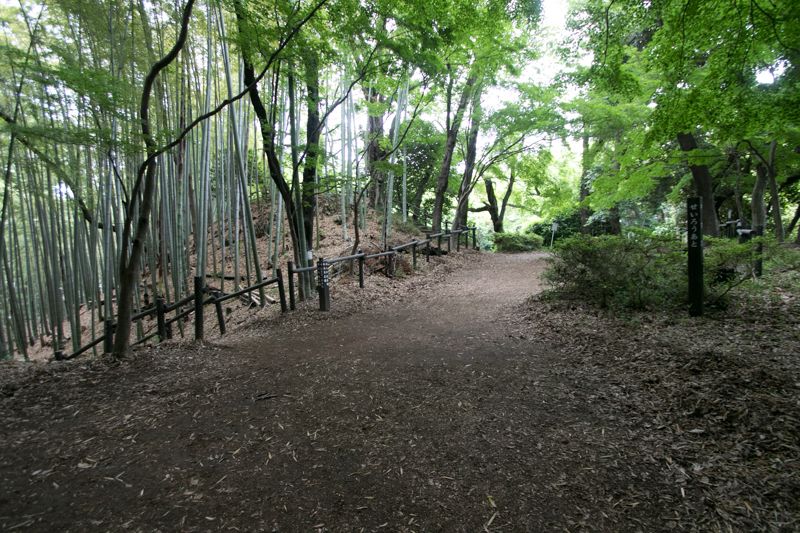 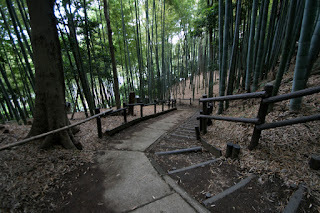 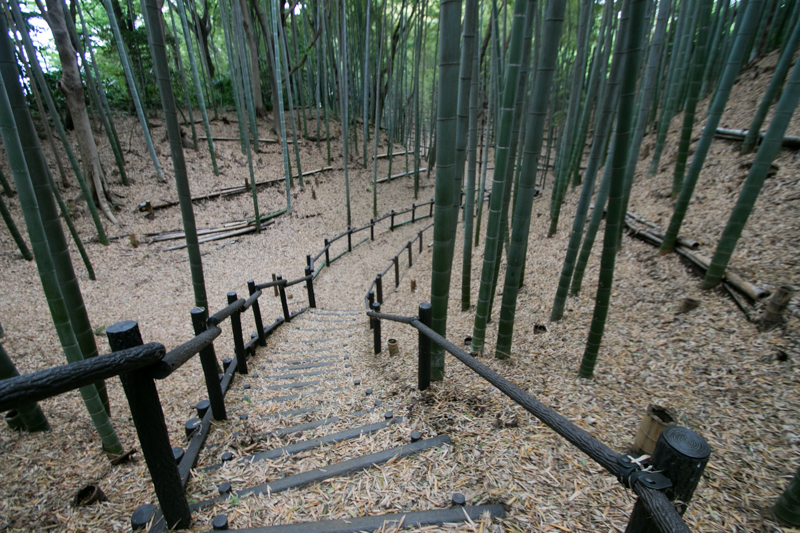 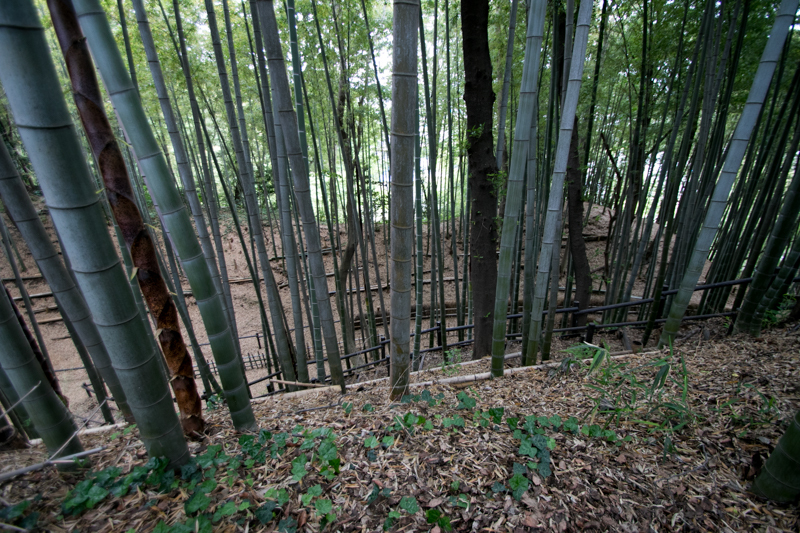 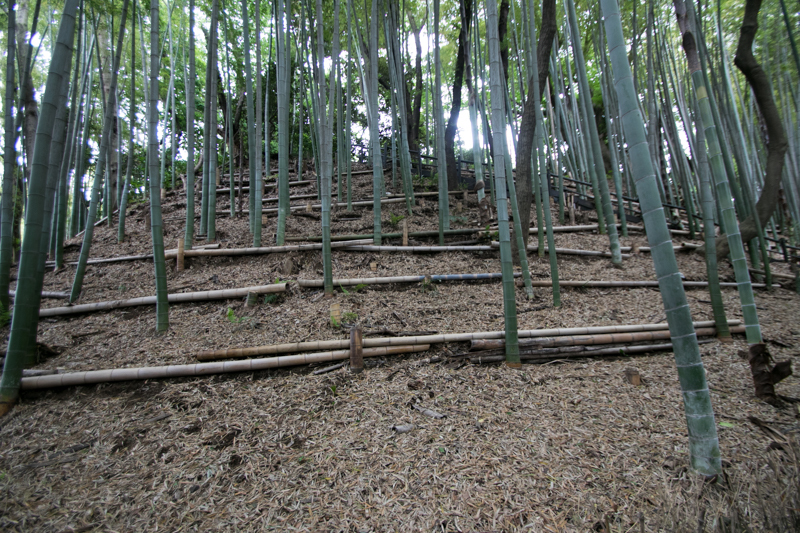 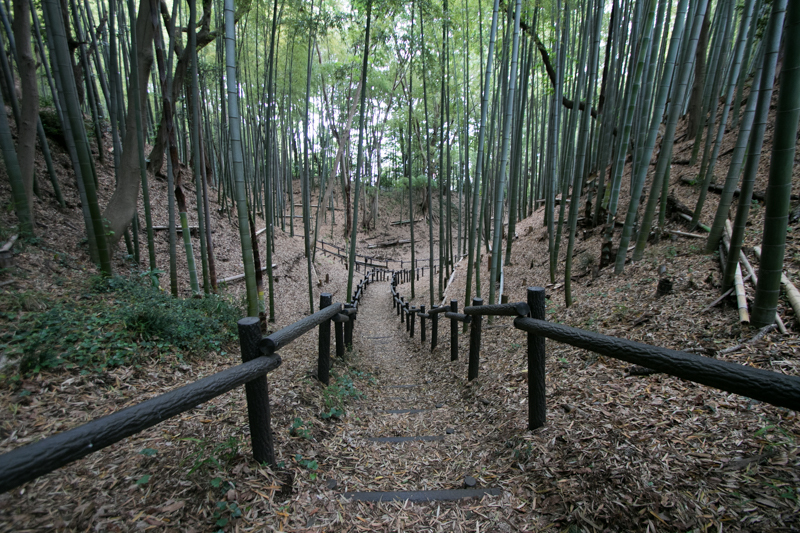 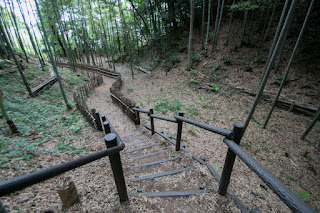 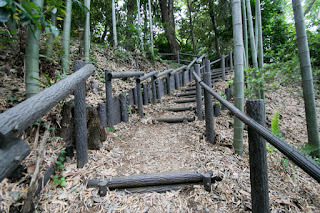 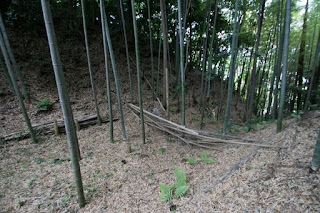 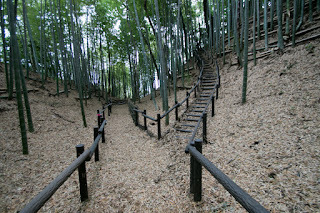 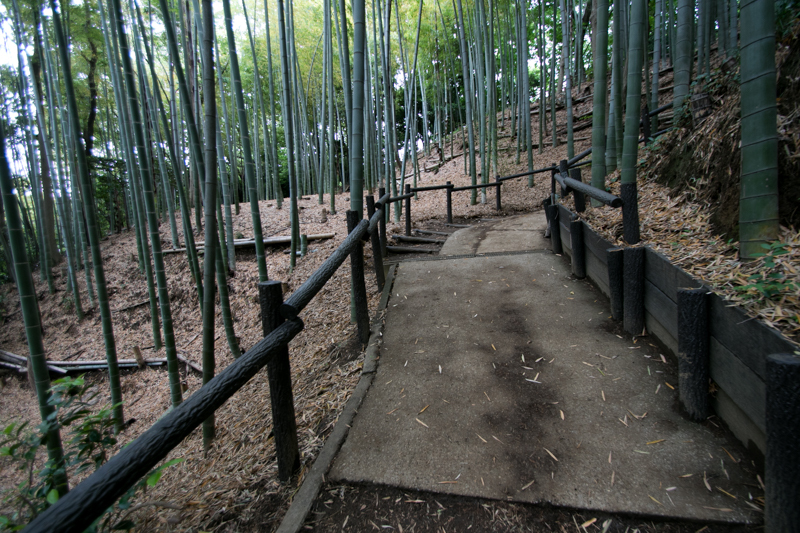 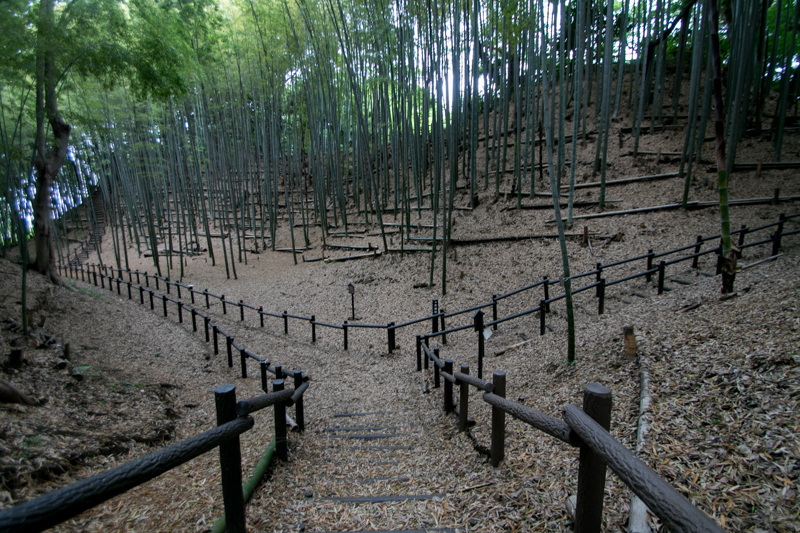 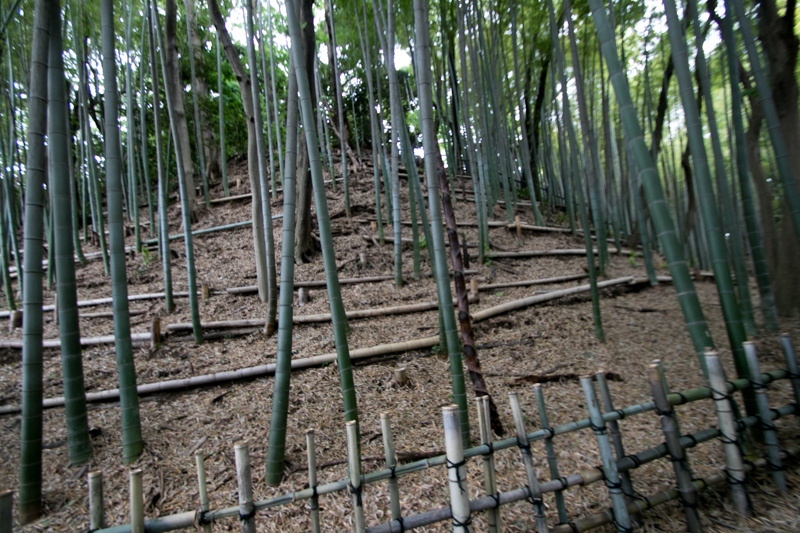 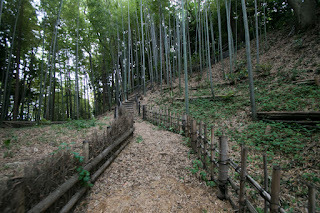 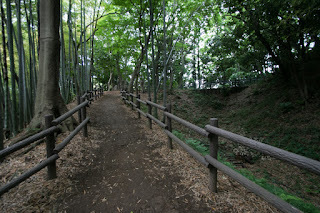 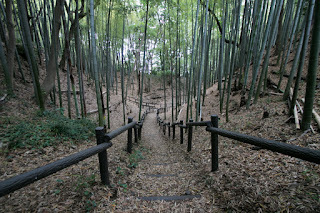 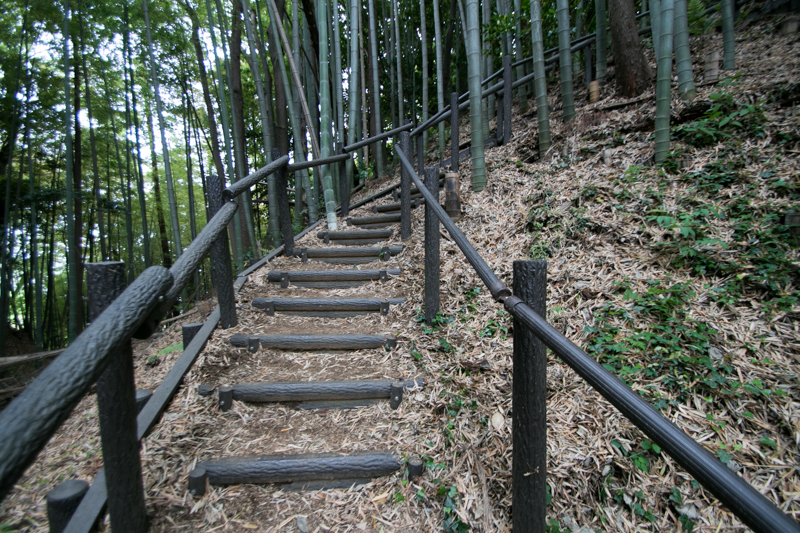 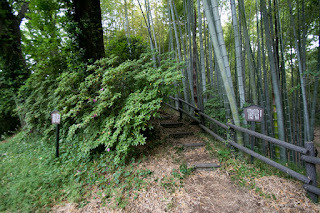 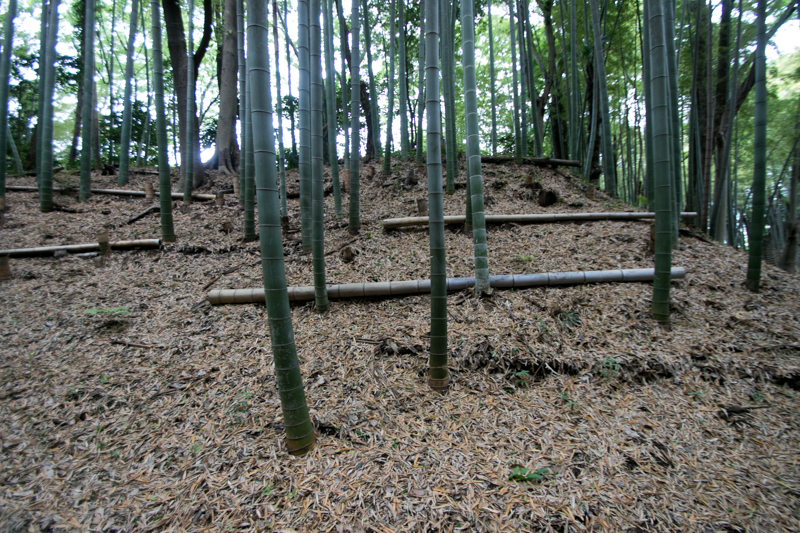 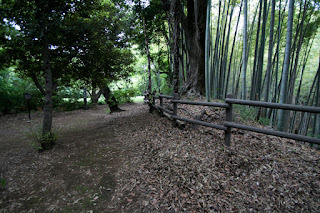 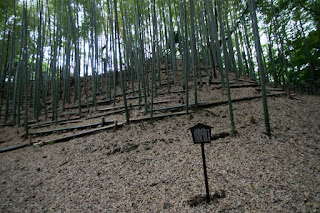 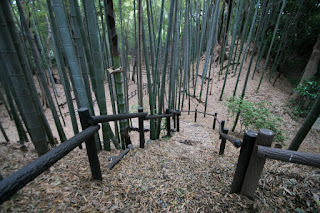 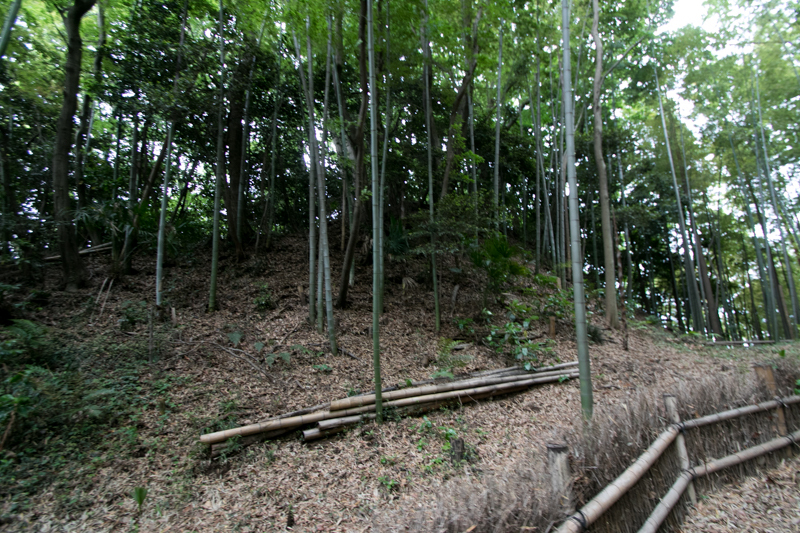 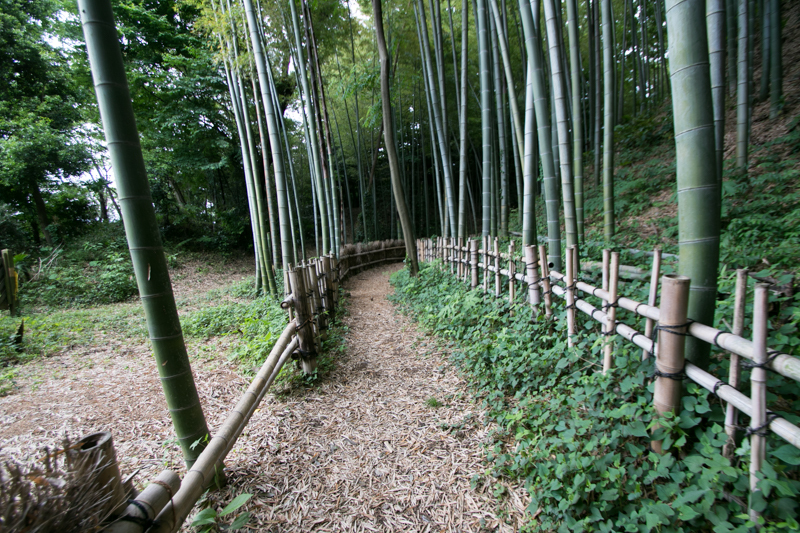 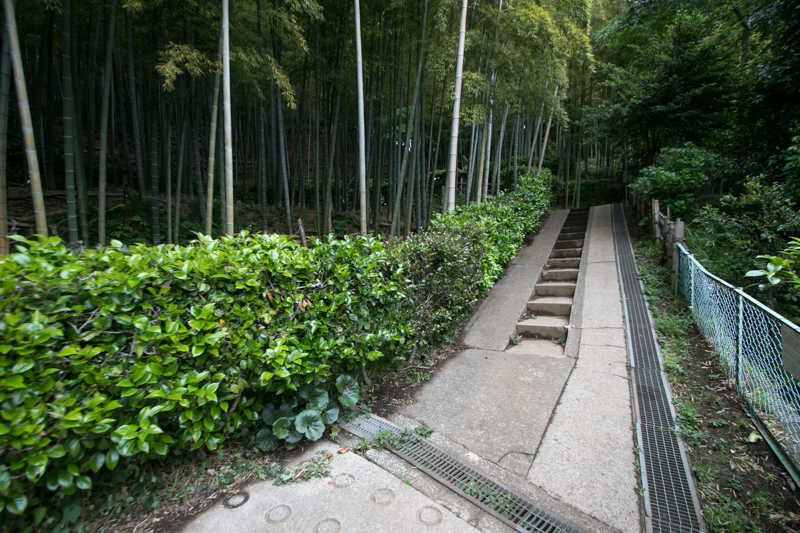 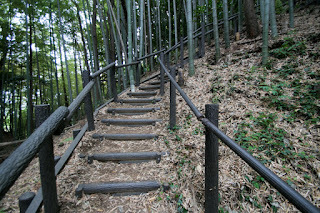 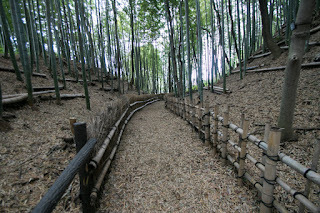 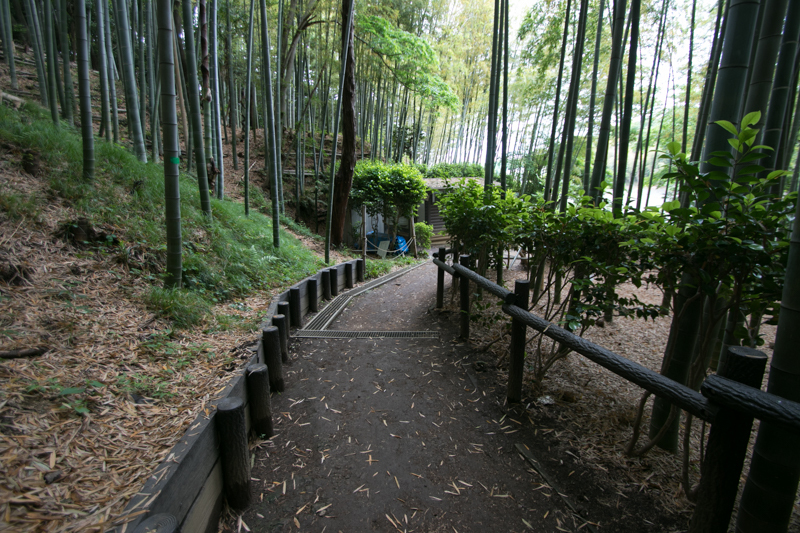 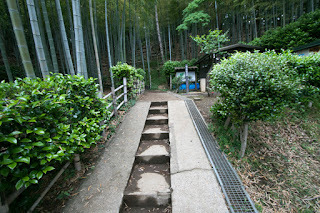 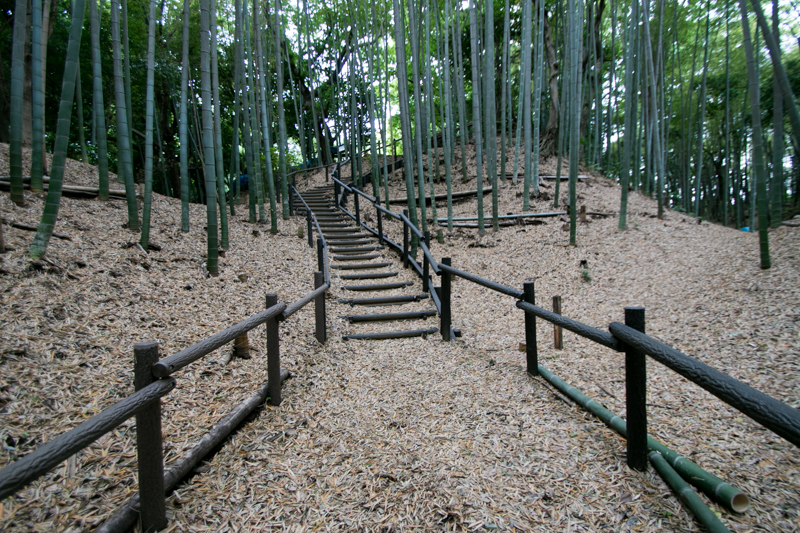 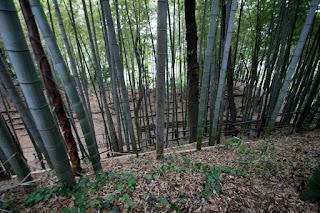 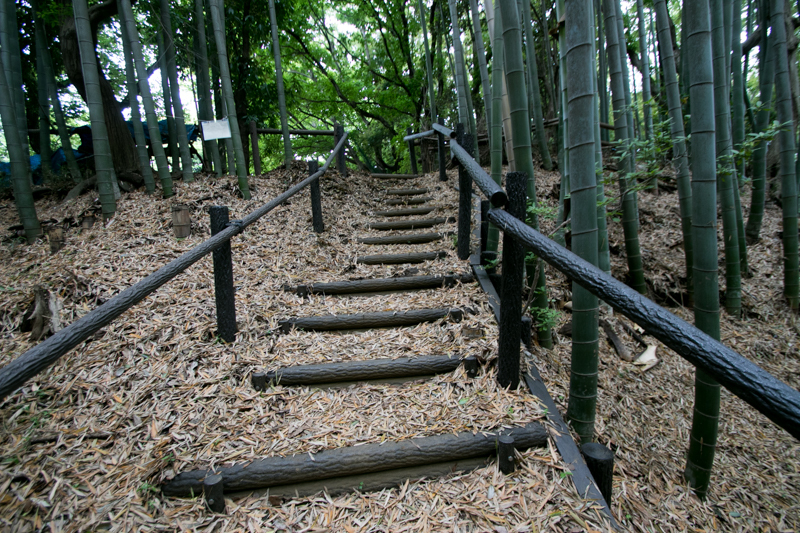 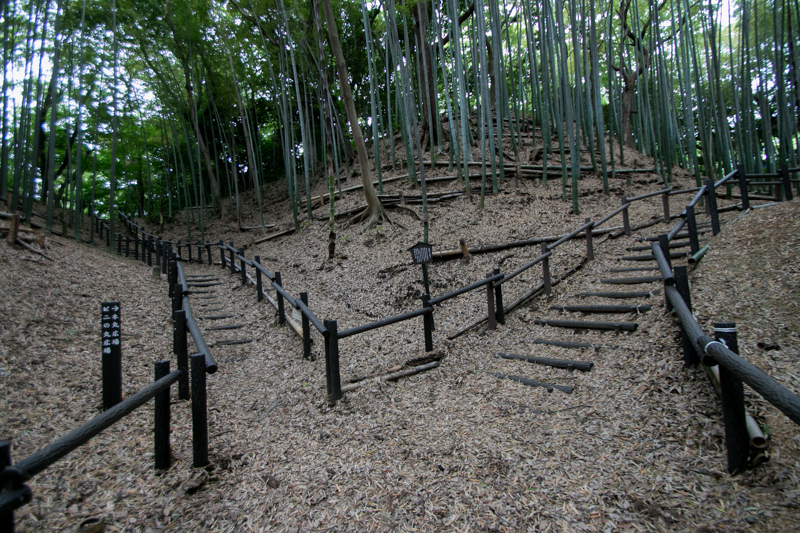 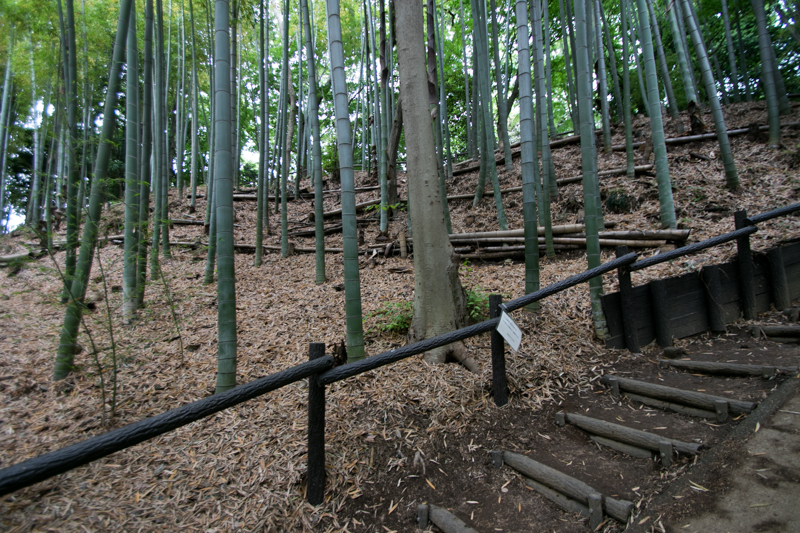 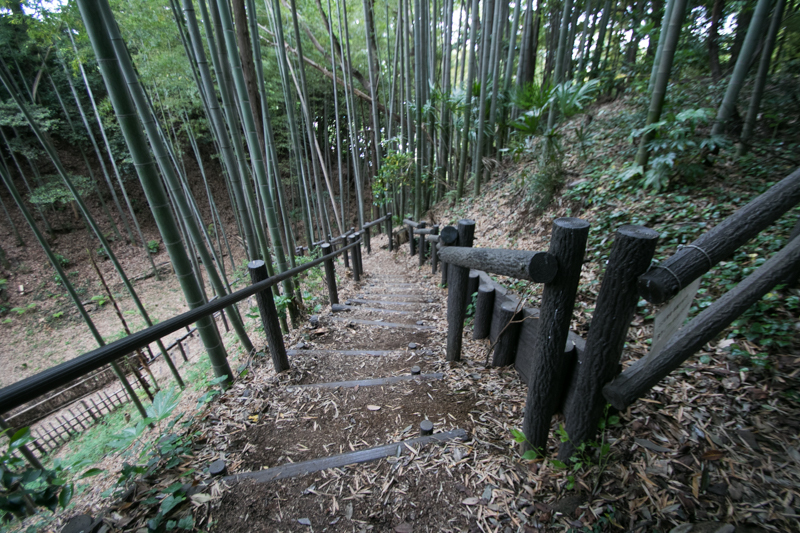 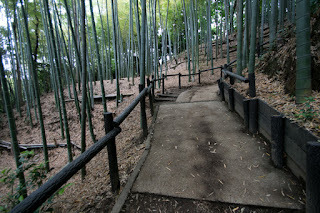 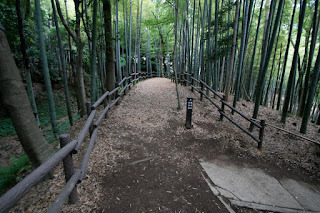 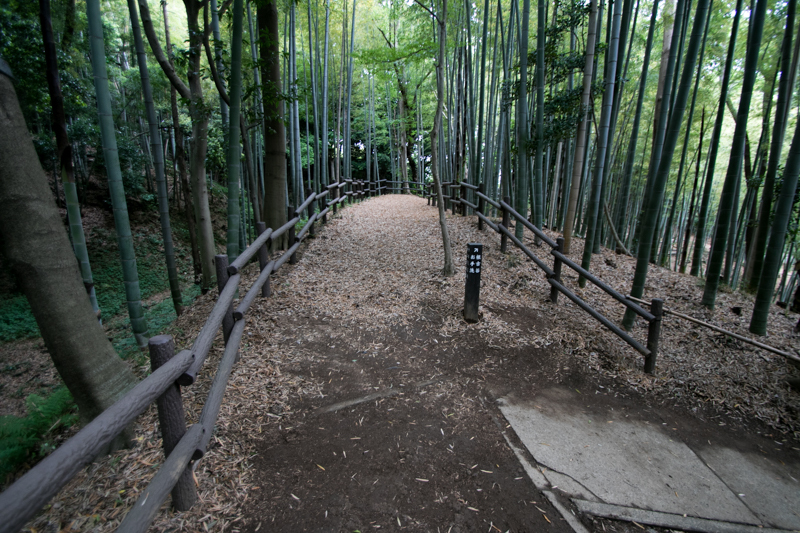 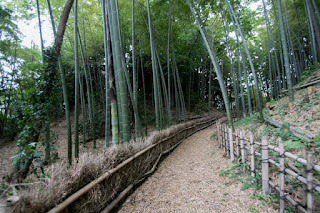 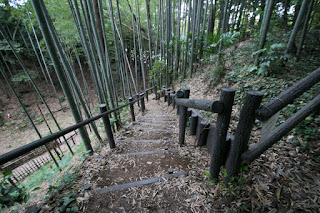 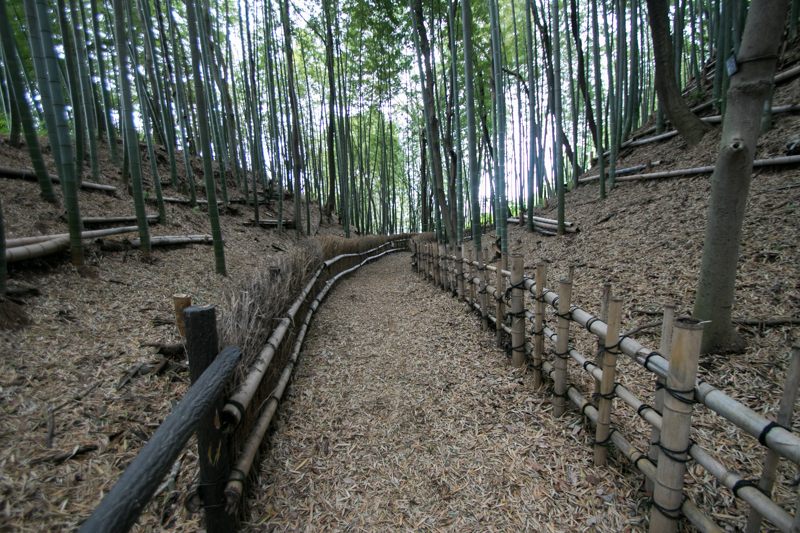 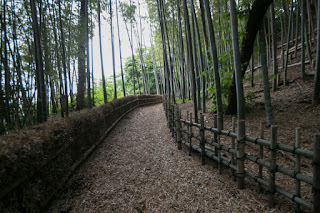 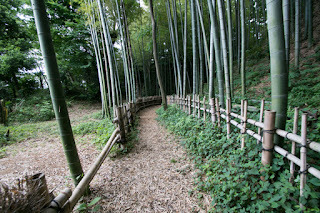 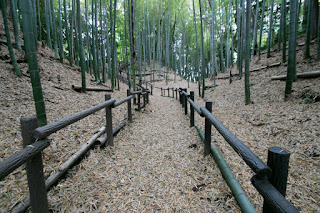 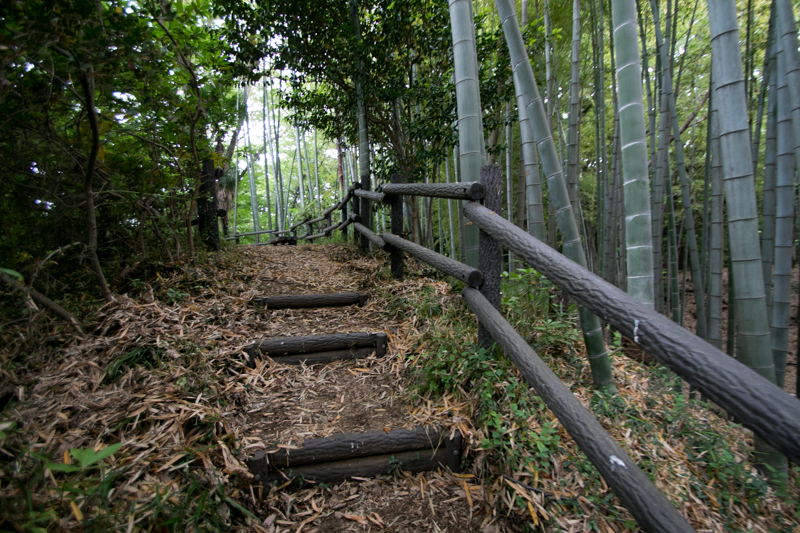 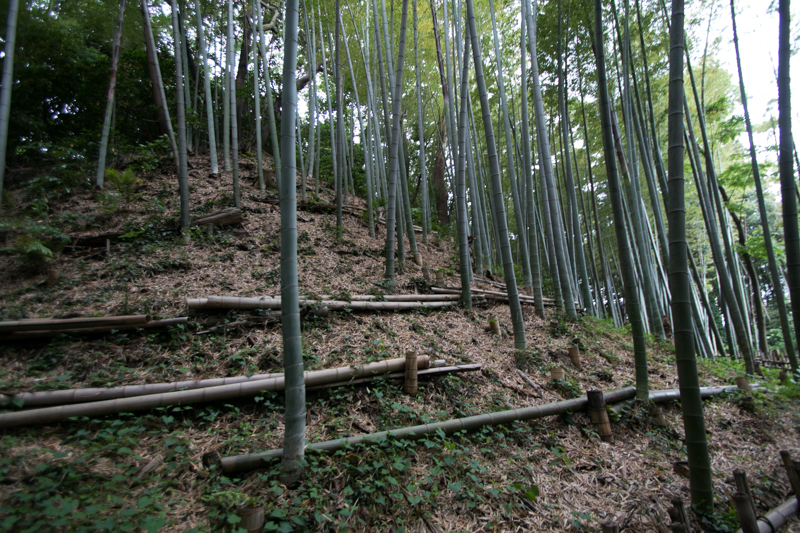 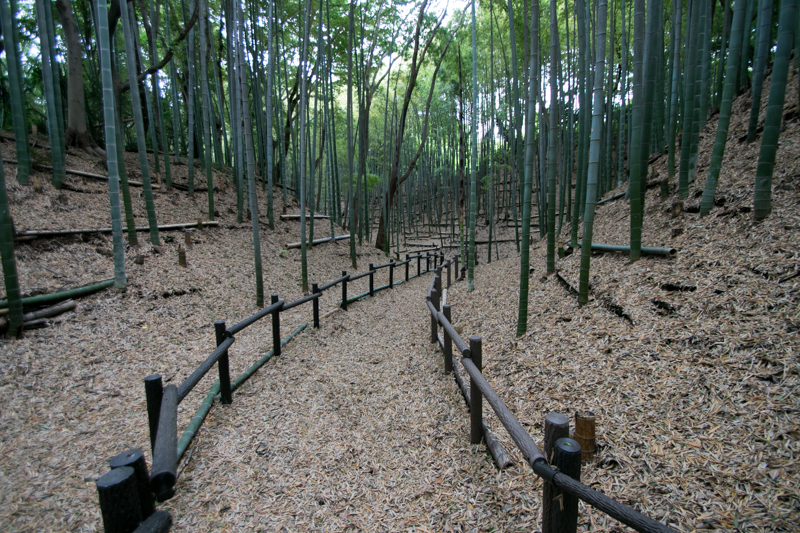 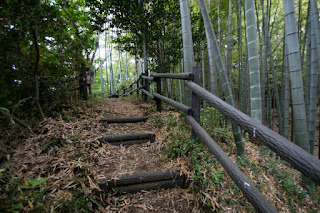 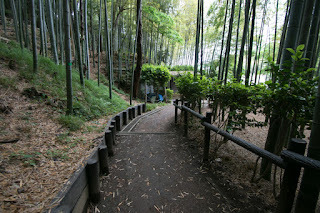 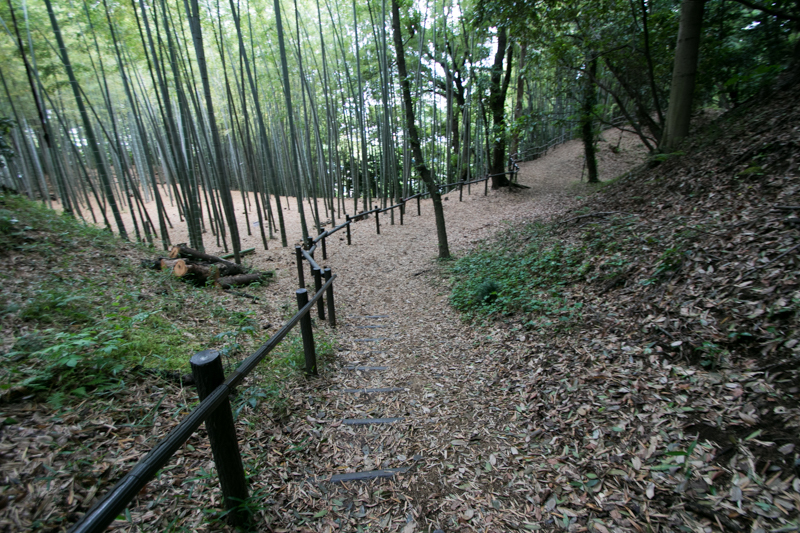 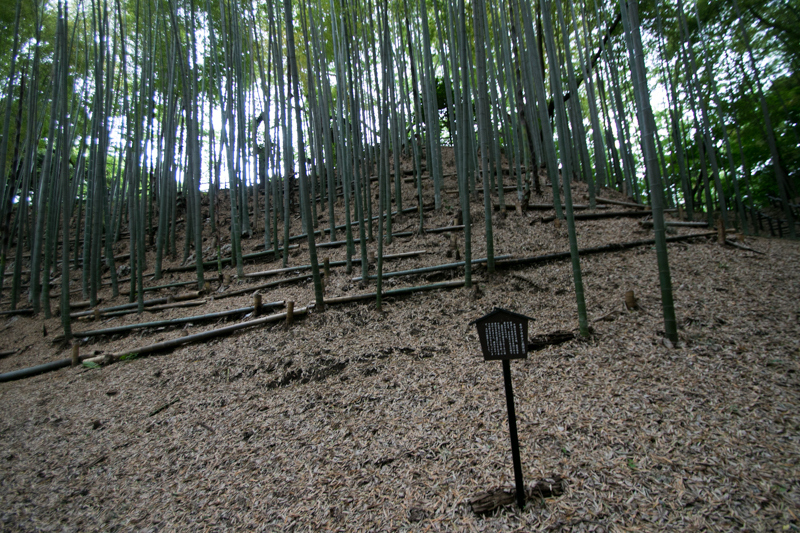 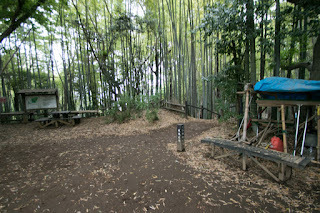 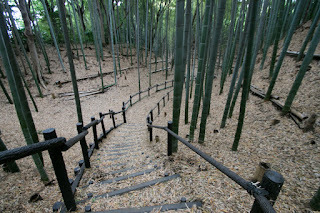 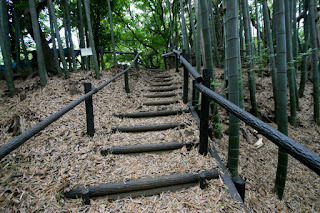 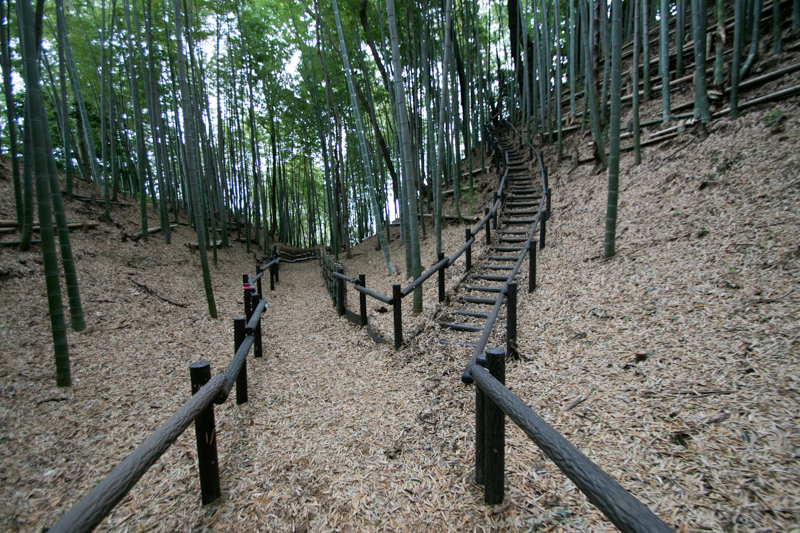 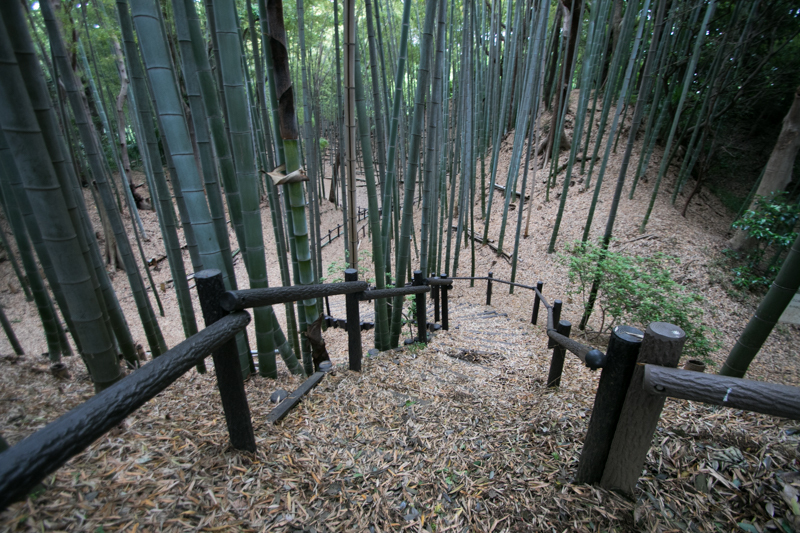 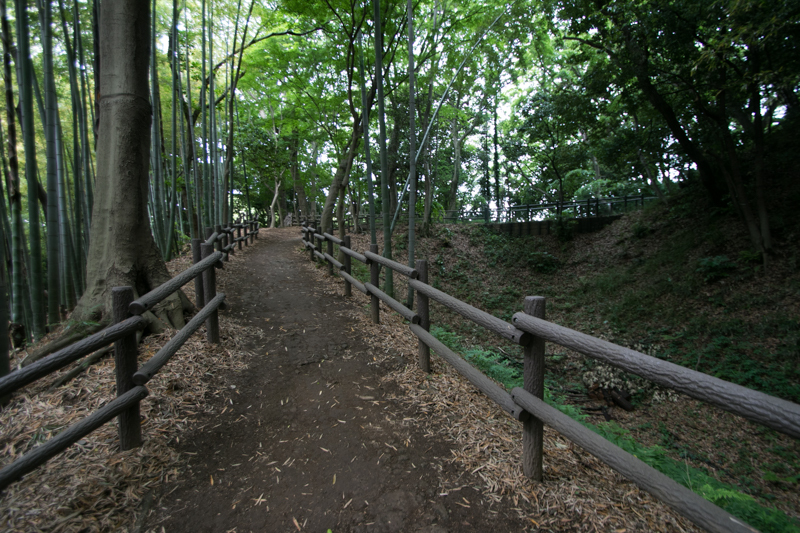 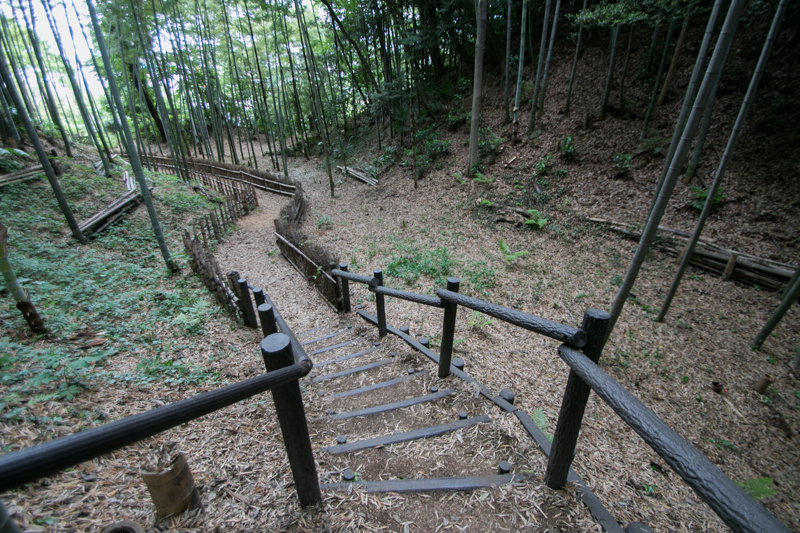 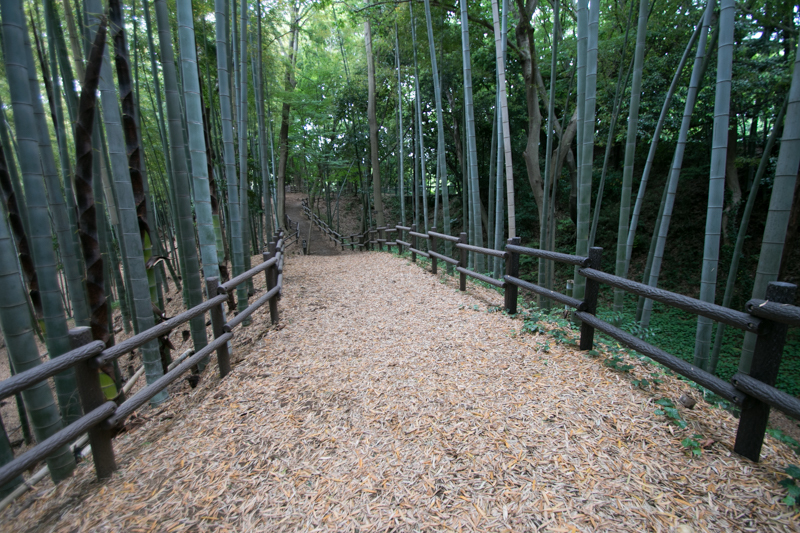 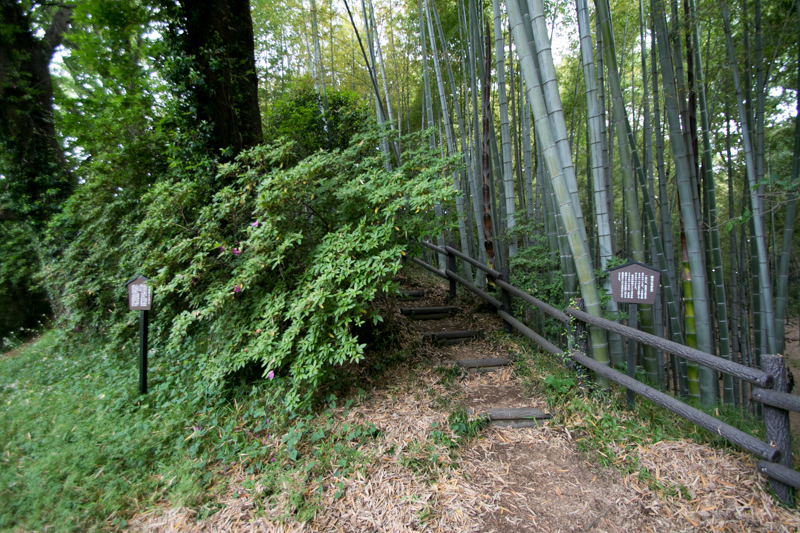 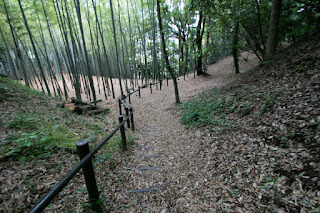 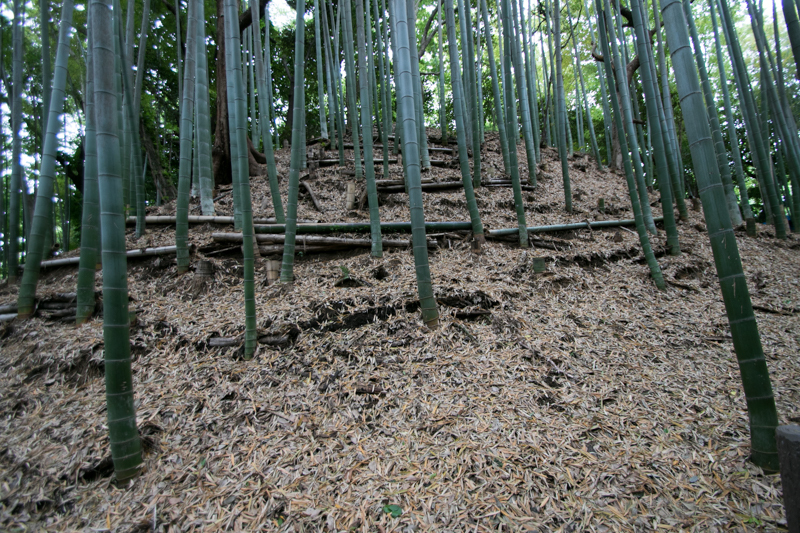 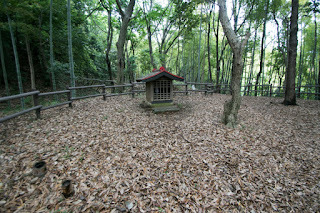 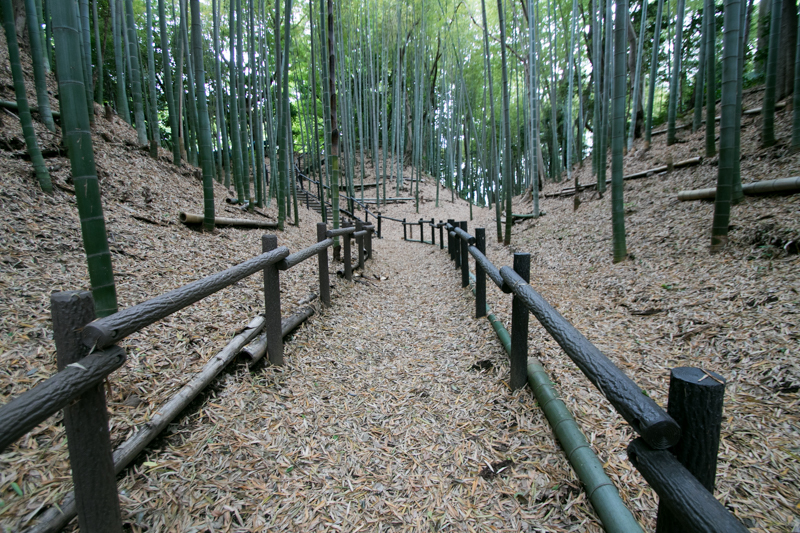 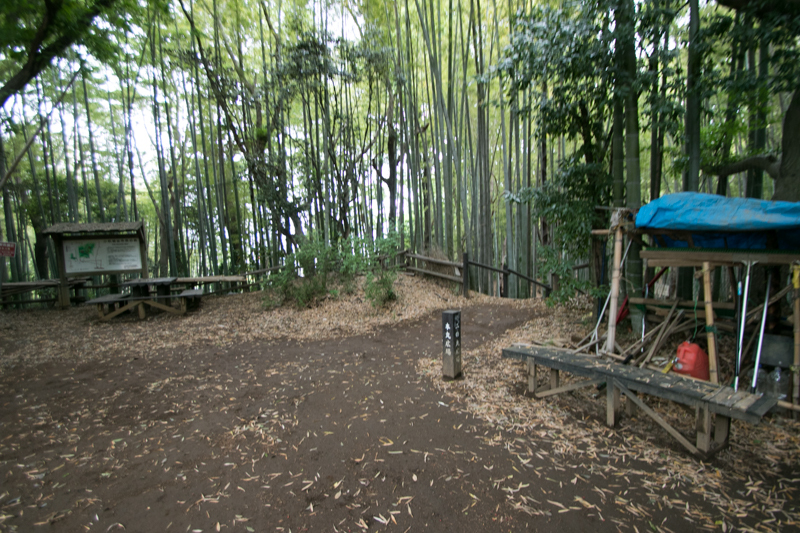 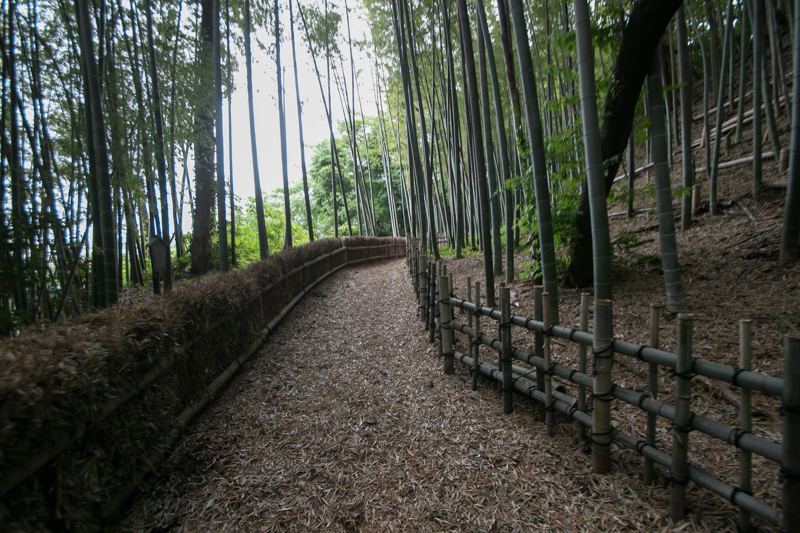 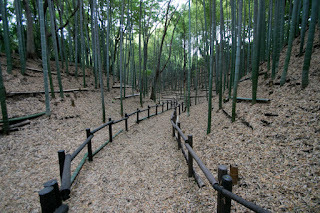 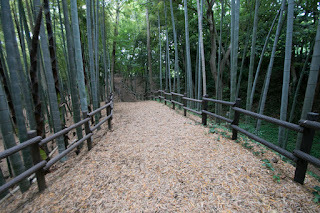 The traditional style castle in bamboo forest matches to the image of cultural elder of Hojo clan. 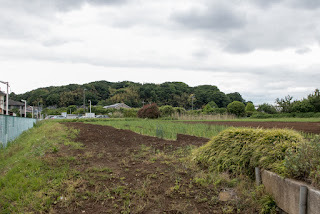 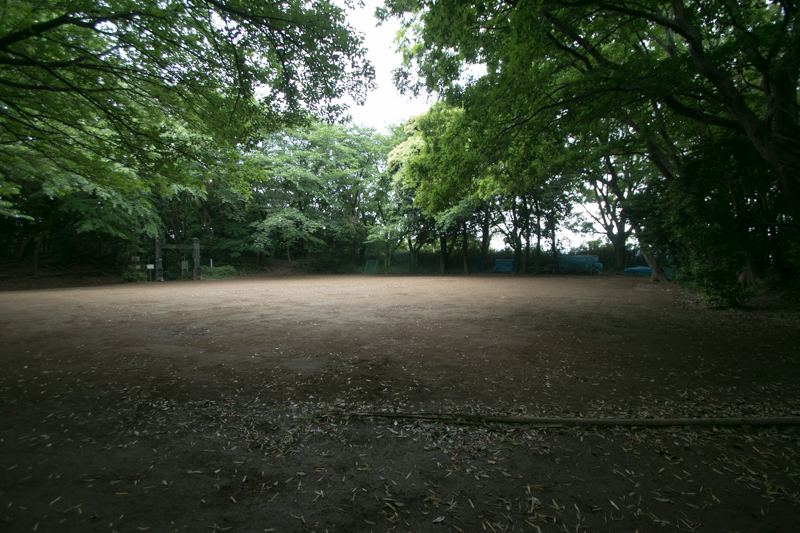 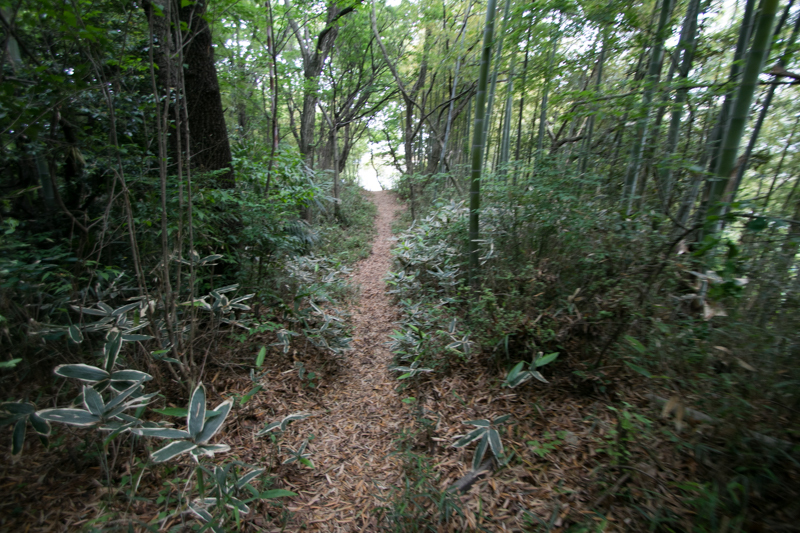 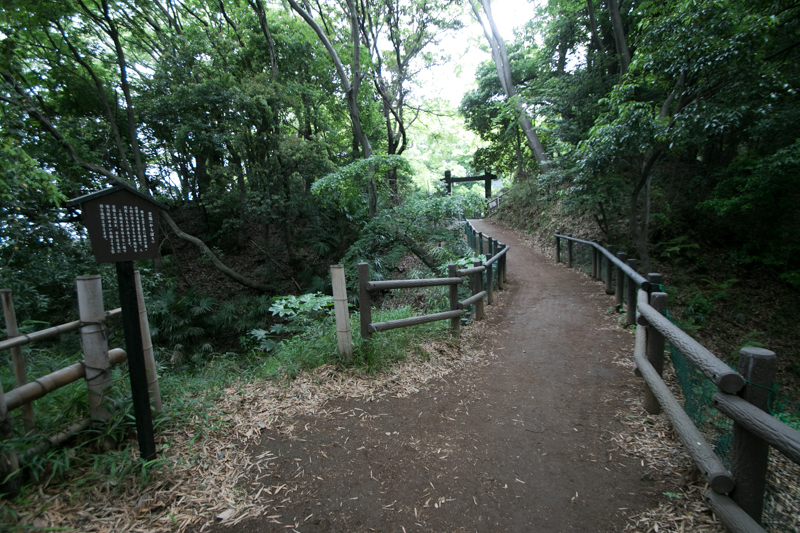 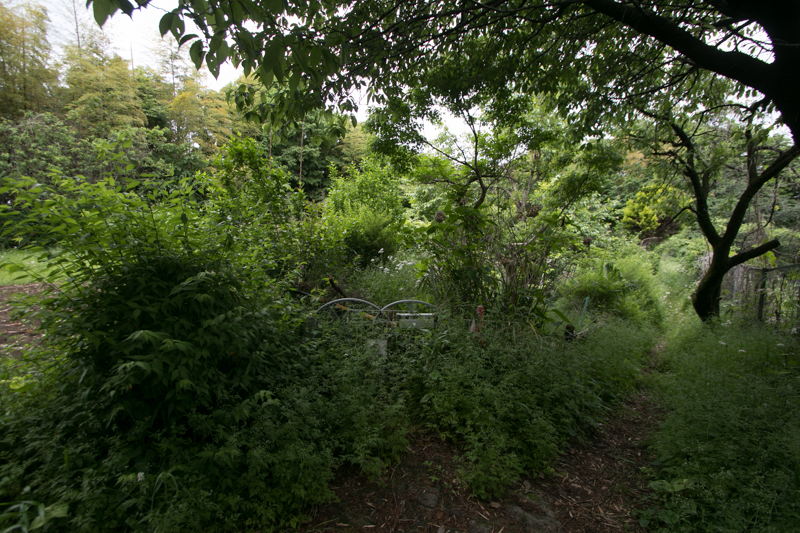 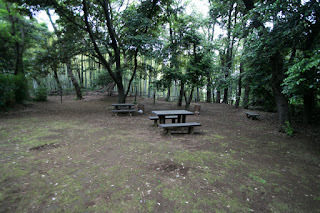 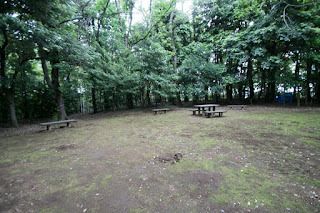 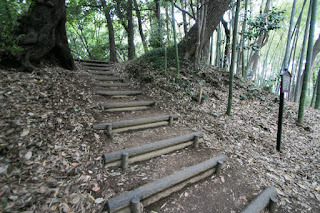 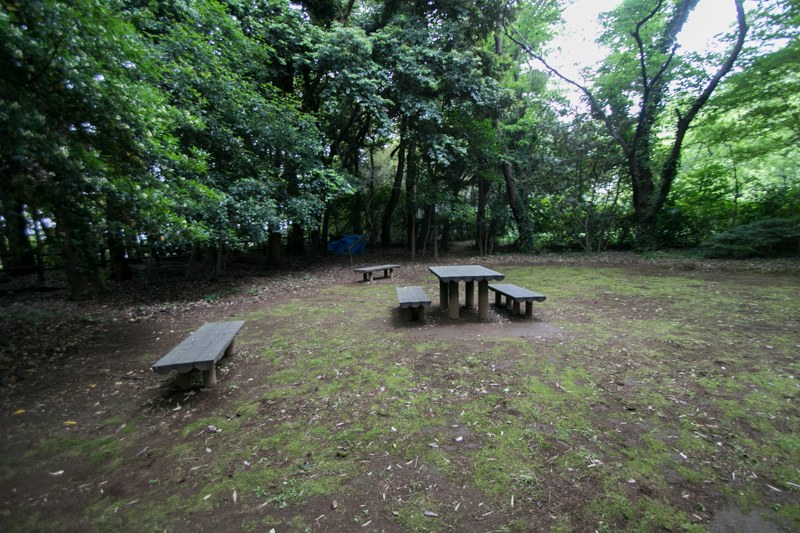 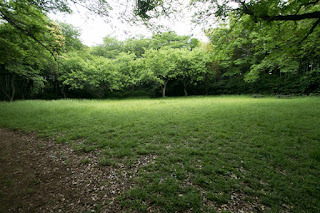 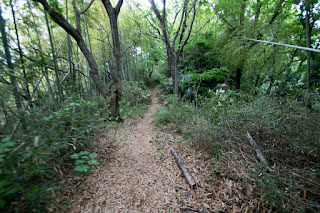 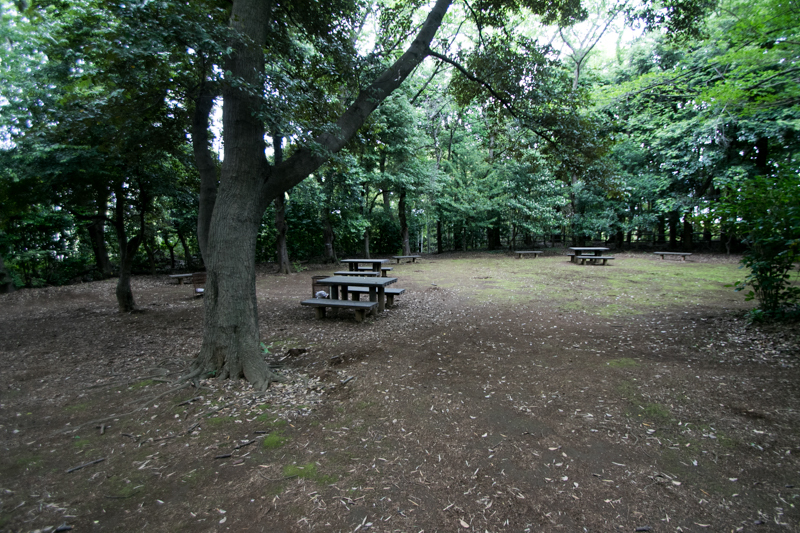 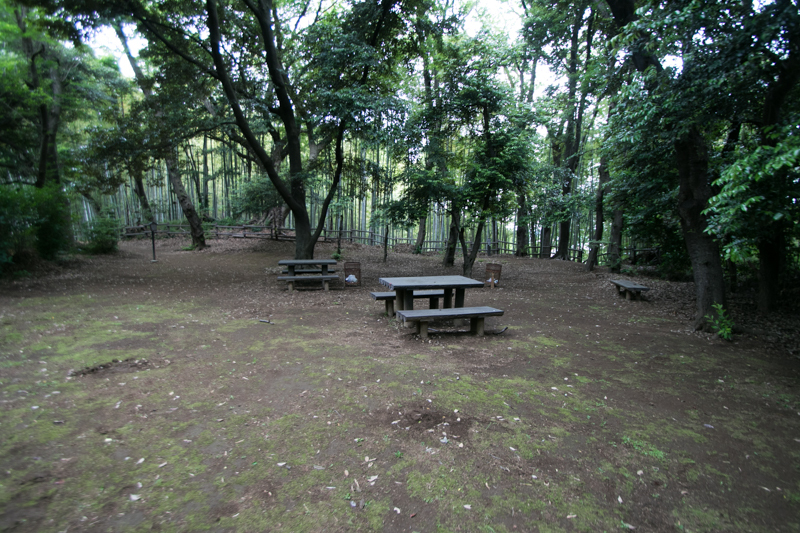 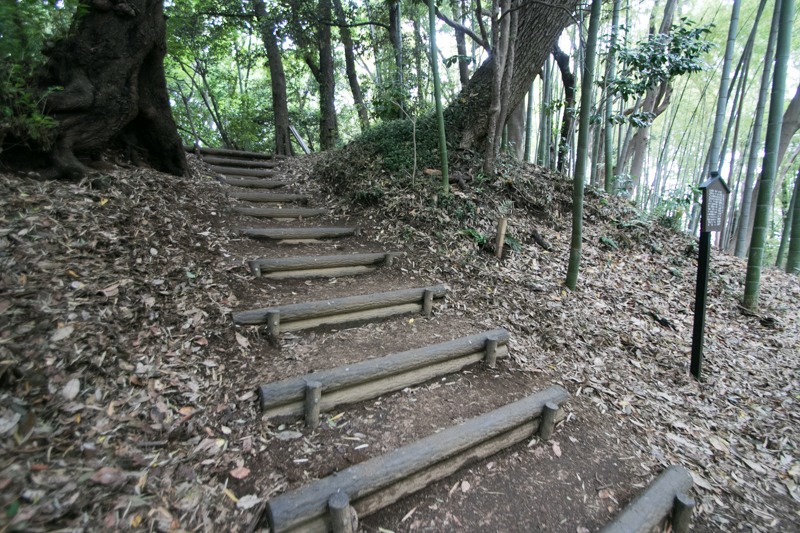 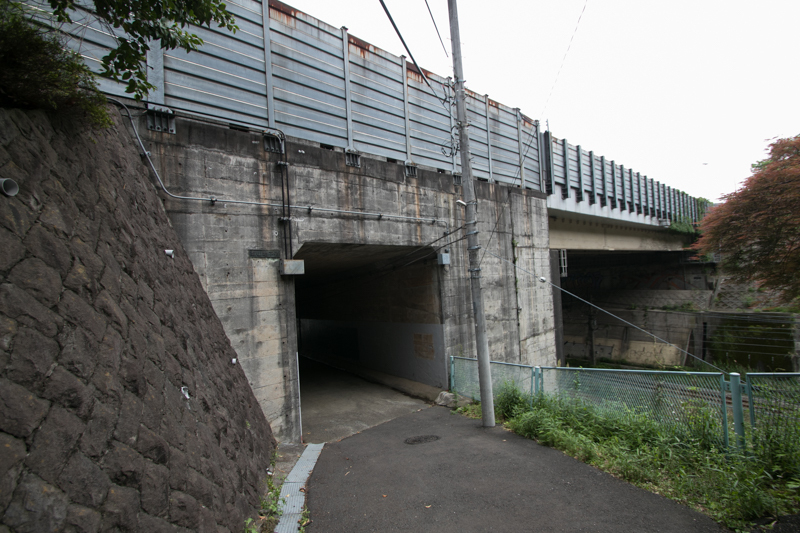 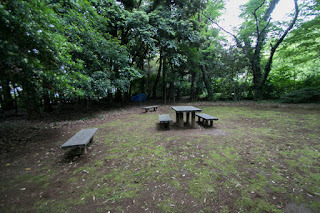 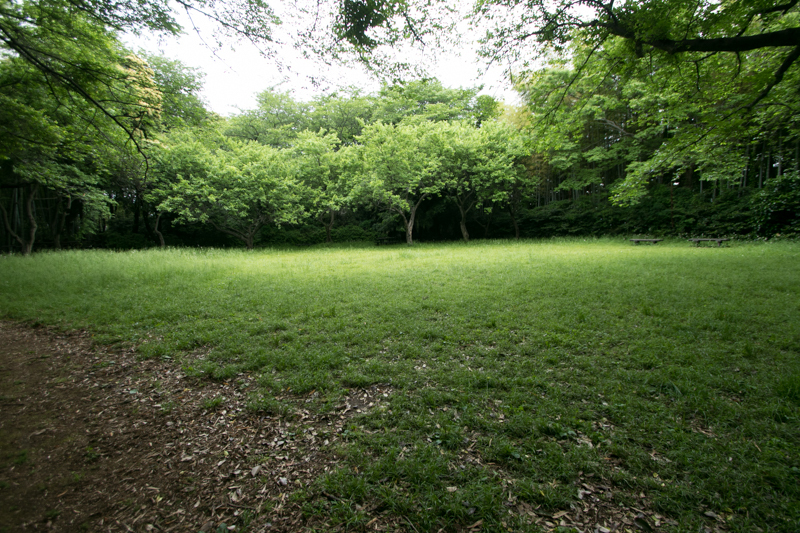 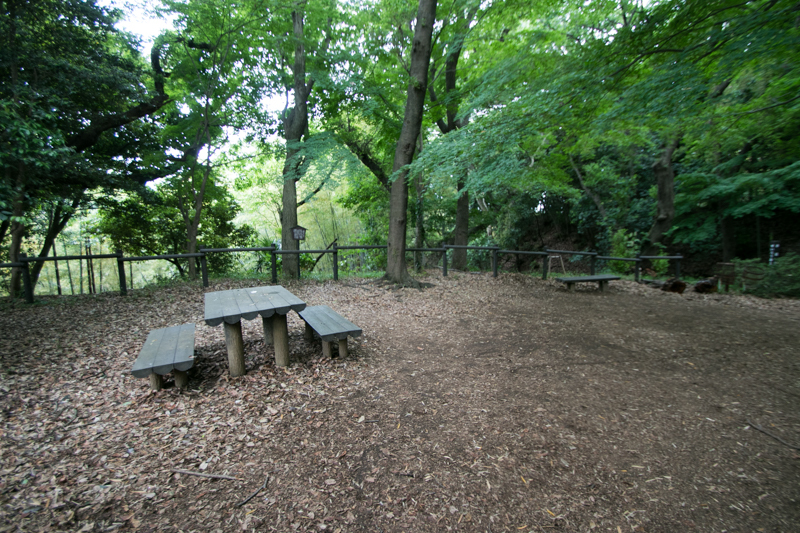 15 minutes walk from JR East Yokohama line Kozukue station. 10 minutes drive from Daisan-Keihin toll road Kohoku interchange (parking is only at the side of Kozukue station).